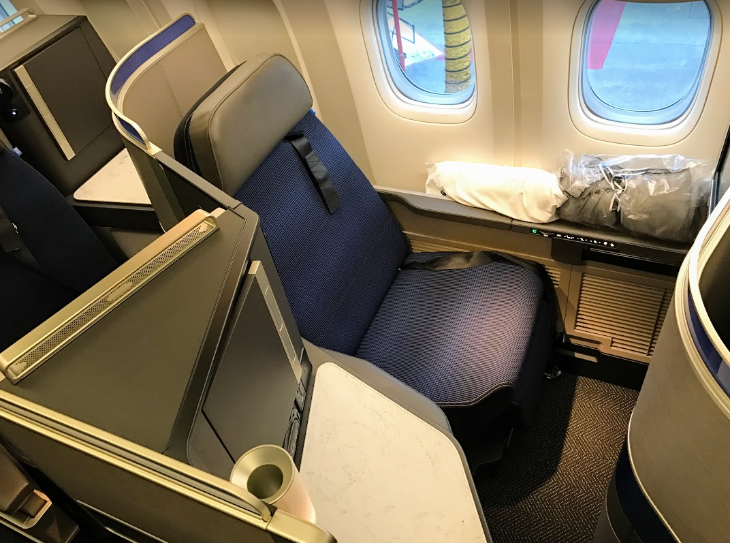 If you’ve been eagerly awaiting a chance to try out United’s much-hyped Polaris business class on one of its new 777-300ERs, you might have to wait a bit longer than you expected. 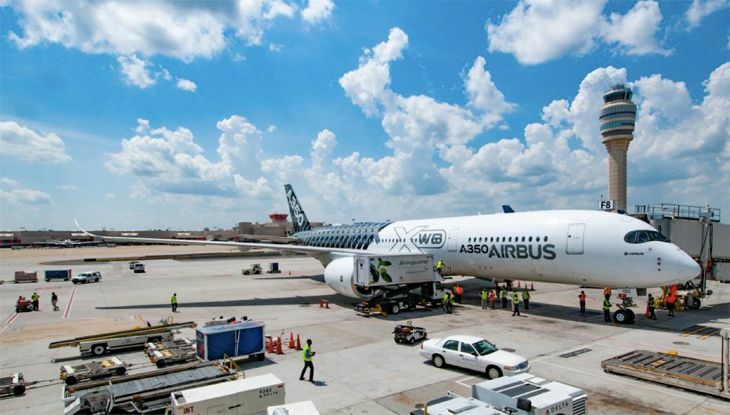 The deployment of the new aircraft with the new front-cabin product is being held up by a supply-chain bottleneck – specifically, the failure of a European manufacturer to deliver the new Polaris seats on schedule. United just put the new aircraft into service on its popular San Francisco-Hong Kong route, replacing a 747-400, and is due to start flying it May 5 on one of its two daily Newark-Tel Aviv flights (presumably using the aircraft that is currently flying between Newark and San Francisco). Beyond that we haven’t seen specific route assignments for the new planes yet, although it is speculated that United would use them mainly on transpacific routes starting this summer. United has ordered 14 new 777-300ERs with the Polaris cabins. Last week, an aircraft-tracking website said that United has temporarily put two newly delivered 777-300ERs into storage pending delivery of new Polaris seats. United officials confirmed that two aircraft are facing “short delays” in deployment due to the seats issue. The problem is with Zodiac Aerospace, a seat-maker based in France that has run into production delays at its plant in Wales. Last year, American Airlines had a similar problem with Zodiac, which was providing business class seats for AA’s new 787-9s. That prompted American to drop Zodiac and switch to another supplier, B/E Aerospace. Zodiac seat delays are also said to be affecting Airbus’ new A350 wide-bodies. United’s marketing team has done a great job building up anticipation about the new Polaris business class. 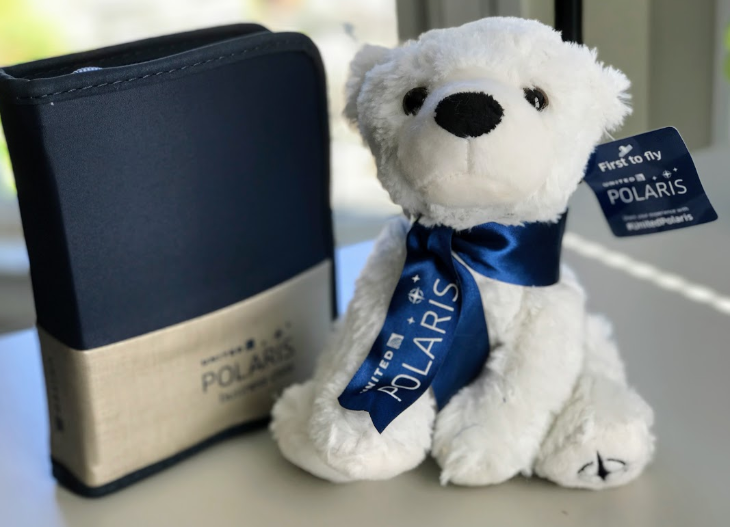 The company has been rolling out on its existing long-haul fleet the in-flight services and amenities that are part of the Polaris experience, and has started opening special Polaris lounges in key airports. But the full experience depends on the flat-bed seat-pods, and international business travelers could now face a longer-than-expected wait to try those out. For a detailed look at the Polaris product, check out our three-part preview that ran last fall. Here’s Part 1, Part 2 and Part 3. 2 How often are planes washed? We’ll be tuning in for this travel geeky PBS series on Feb 8– will you? 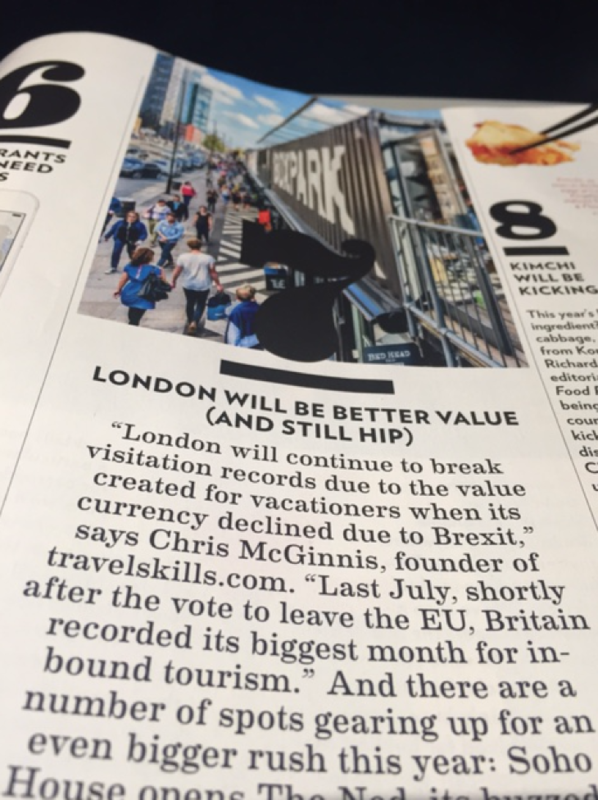 TravelSkills reader Janis C spotted TravelSkills’ Chris McGinnis quoted in this month’s American Way magazine en route to London. 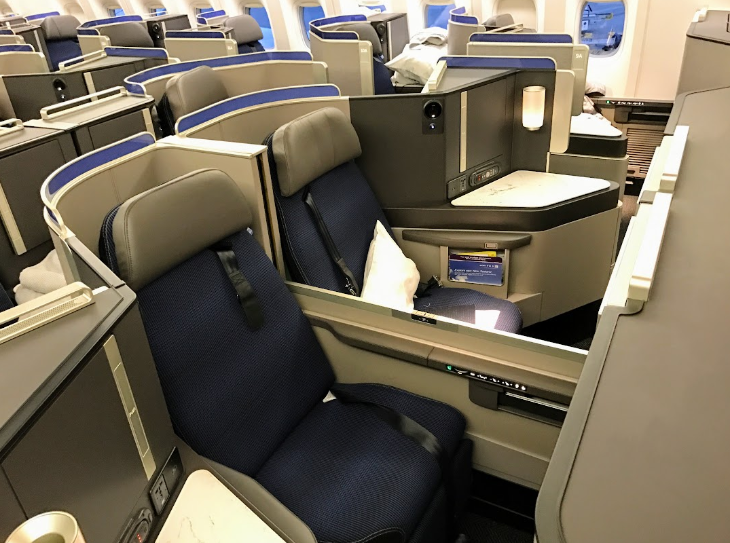 If you want to be among the very first to experience United’s Polaris business class on its first new 777-300ER, your miles can make it possible – but you must act fast. 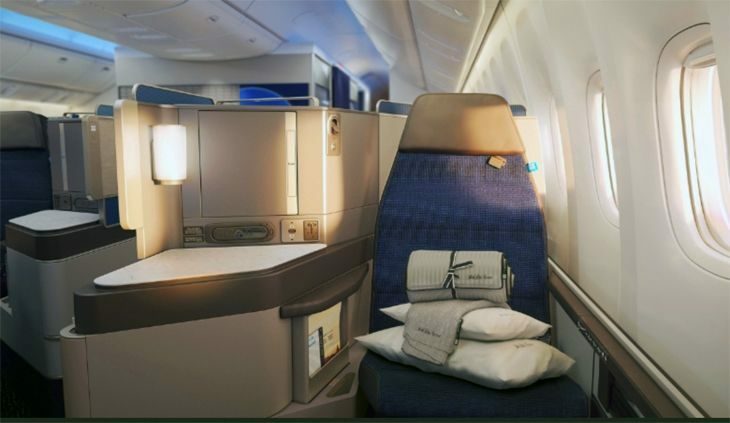 As TravelSkills readers know, United introduced its new Polaris business class service late last year– but it has yet to roll out a plane with the new Polaris business class seat. United’s first Boeing 777-300ER with the new seats makes its domestic debut later this month. 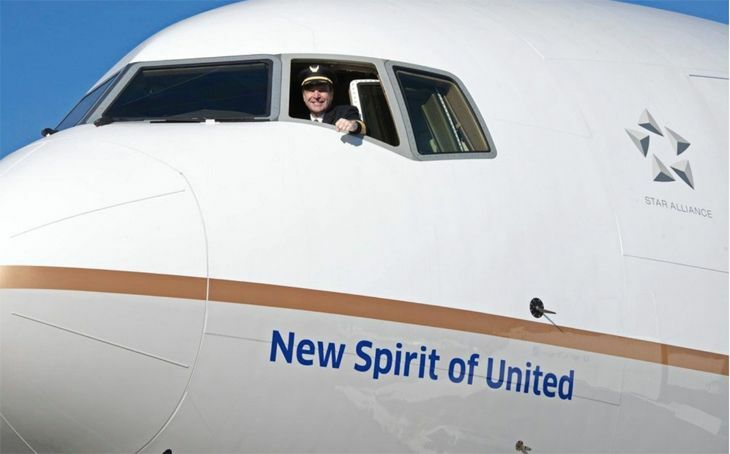 The airline has scheduled a gala inaugural flight for the new aircraft – dubbed ‘New Spirit of United’ — on Monday, February 13, from Chicago O’Hare to San Francisco, and it has started an online auction where MileagePlus members can bid miles to win a pair of seats in the Polaris cabin. The bidding deadline is noon CST on Monday, February 6, and at this writing the minimum bid is 241,000 miles. 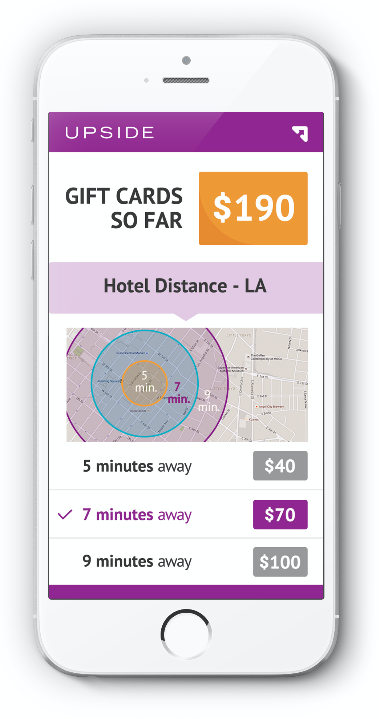 New bids can only be made in increments of 1,000 miles. 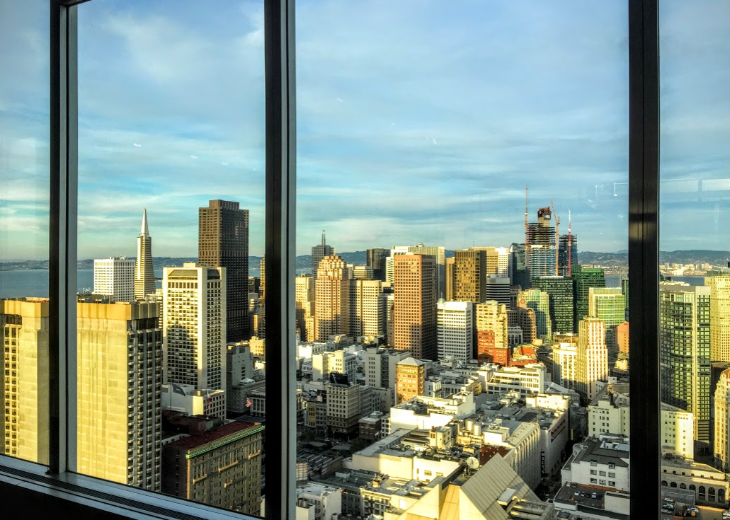 What you’re bidding on is not only two Polaris tickets for the ORD-SFO maiden flight, but an entire package that also includes a pair of economy tickets to Chicago, two more for a flight home from San Francisco, and a hotel stay in San Francisco the night of February 13. You’ll also have access to United’s new Polaris lounge at O’Hare. You must be 21 or older to participate, and you can’t check any bags – carry-ons only. To see all the details and to submit a bid, click here. 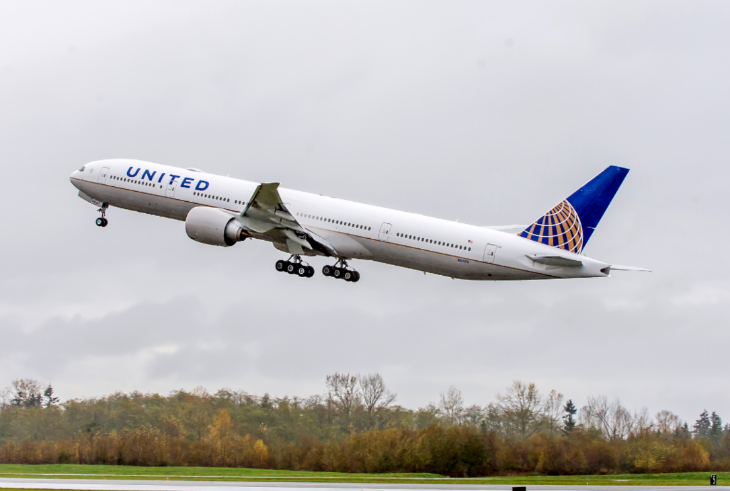 The first scheduled service of a Polaris-equipped 777-300ER will be on a domestic route, linking United’s San Francisco and Newark Liberty International hubs. The new aircraft will fly six days a week from February 13 through May 4, the airline said. On March 25, the new aircraft will make its international scheduled service debut, replacing a 747-400 on the very competitive San Francisco-Hong Kong route, where Singapore Airlines and Cathay Pacific both offer non-stop service. 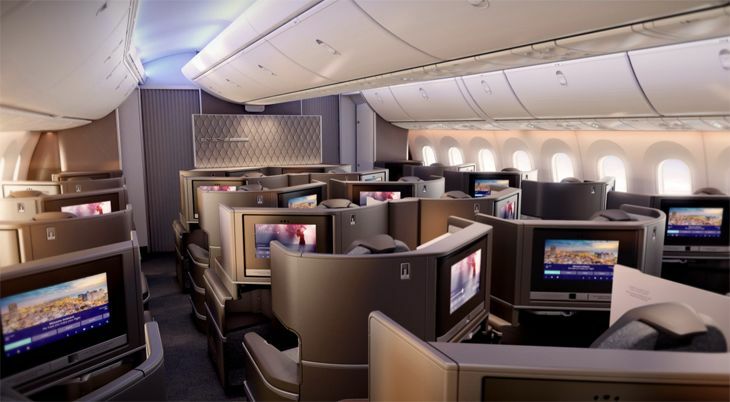 The Boeing 777-300ER will have 60 business class seats— that’s up from around 50 in its 747s and 777-200s. Both Economy Plus and regular economy seating will be 10-across, configured 3-4-3. Economy Plus will offer 34 inches of pitch vs. 31 inches for regular economy. 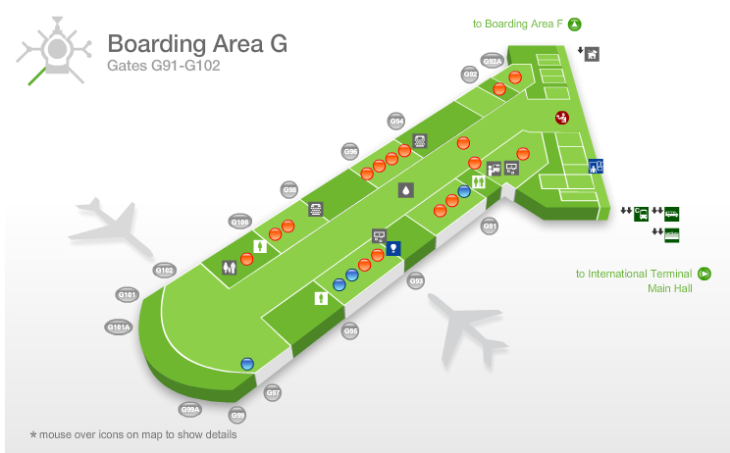 Currently, United’s 777s are 9 across in economy class. 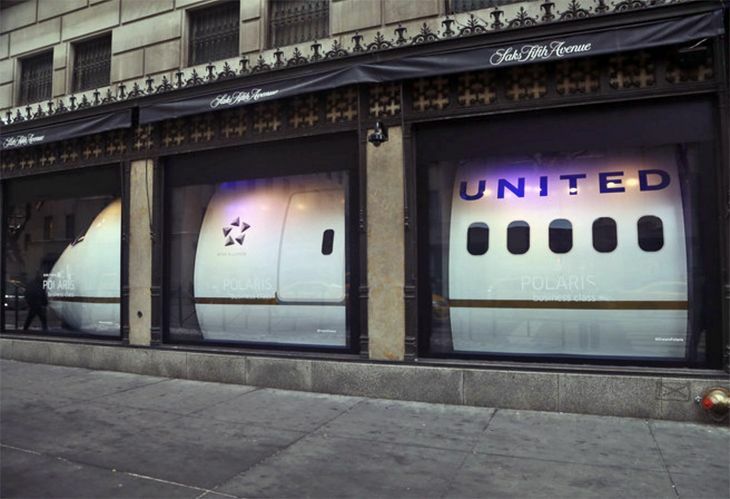 Why does New York City’s Saks Fifth Avenue have a United aircraft inside its windows? 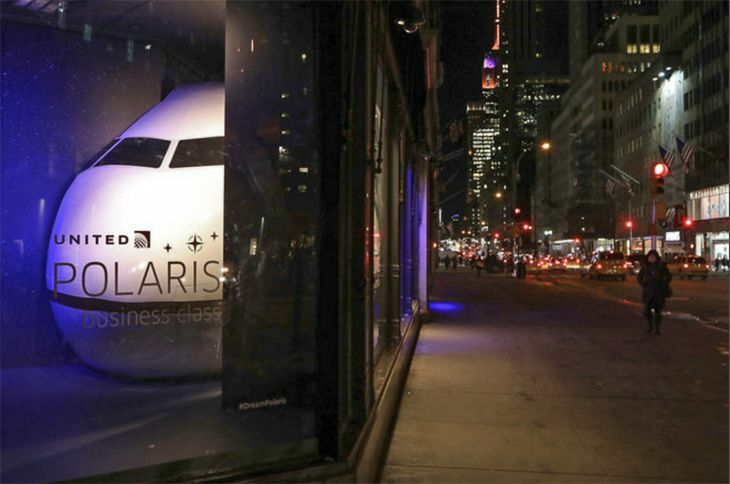 The airline has teamed up with the famous retailer to promote its new Polaris Business Class by installing a mock-up of the cabin – along with part of a fuselage – in the windows of Saks’ flagship store facing Fifth Avenue between 49th and 50th streets. Besides offering a public showcase for United’s new international business class cabin, Saks also provided custom-designed bedding for passengers. 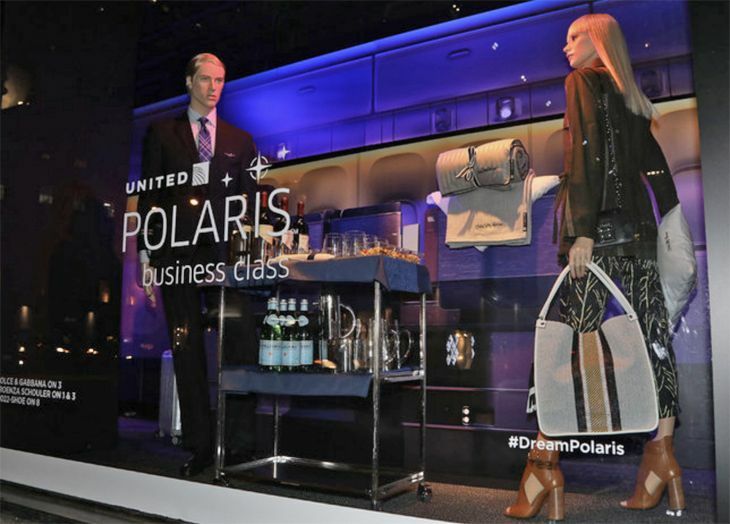 The unusual window displays – titled “Now Arriving” — will remain in place through January 22, United said. 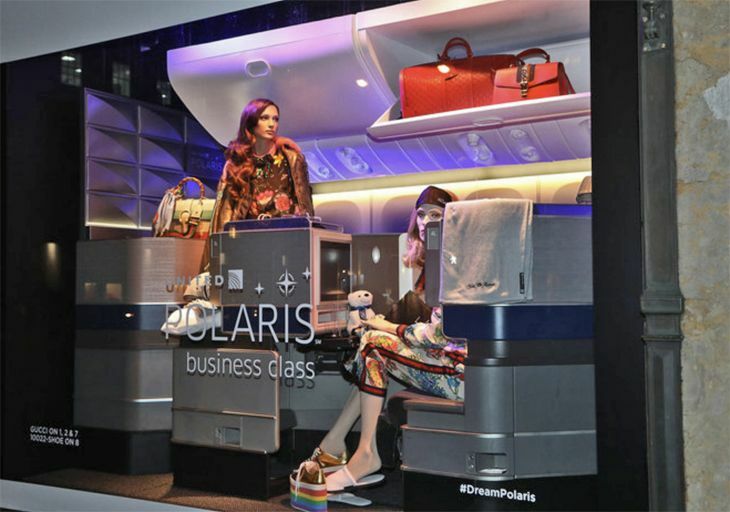 The total display takes up 14 windows, with the six center windows showing the interior of a new business class cabin, with full-size seats (and the Saks bedding, of course). 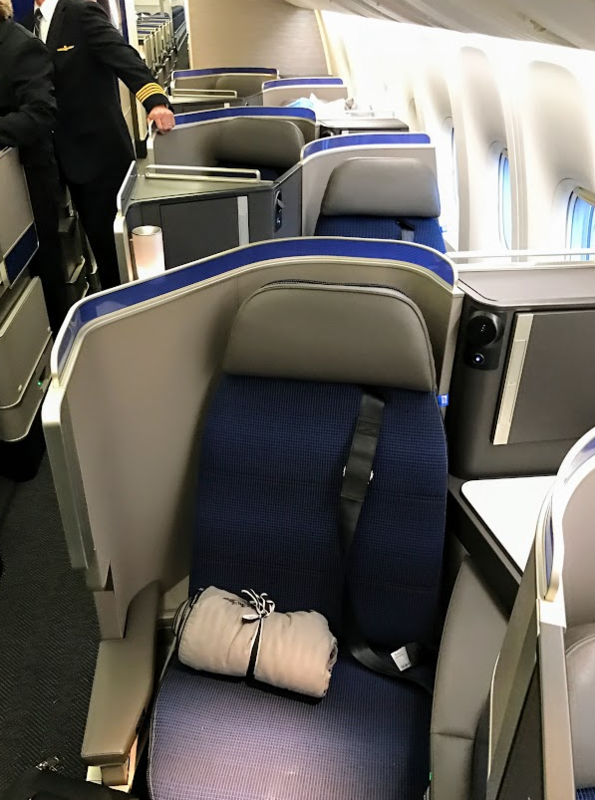 United is beginning to roll out the new Polaris cabins on its 777-300ERs during the first quarter, and will eventually install it on other widebodies. 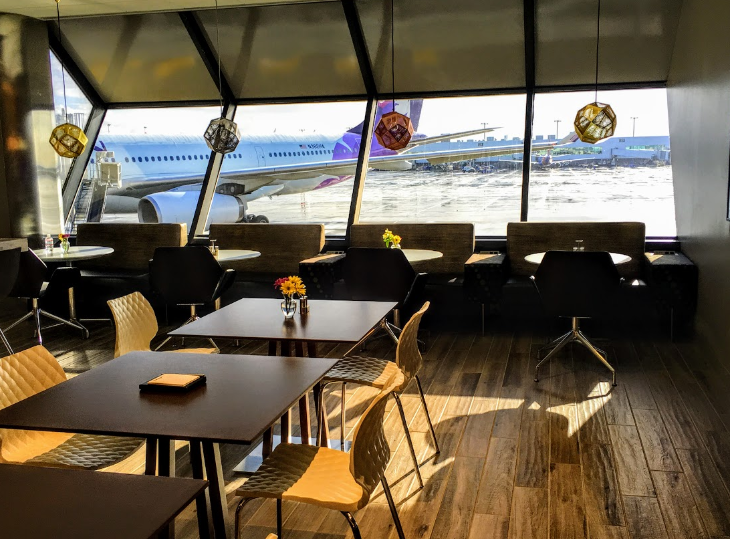 The airline has also opened its first dedicated Polaris lounge at Chicago O’Hare, with additional lounges to follow at eight other key international airports. 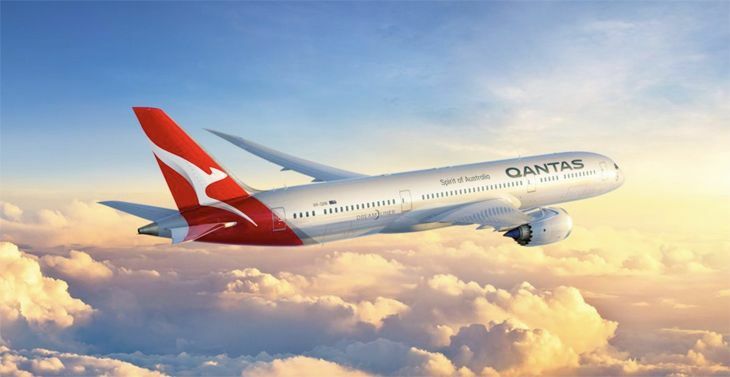 Today Qantas announced that it will soon operate the first nonstop flight between Australia and Europe: Perth-London. It will be the carrier’s longest route. Flights won’t start until March 2018 using the Australian carrier’s new Boeing 787-9 Dreamliner, which carries 236 passengers. The flight is expected to take about 17 hours and cover 9,010 miles. 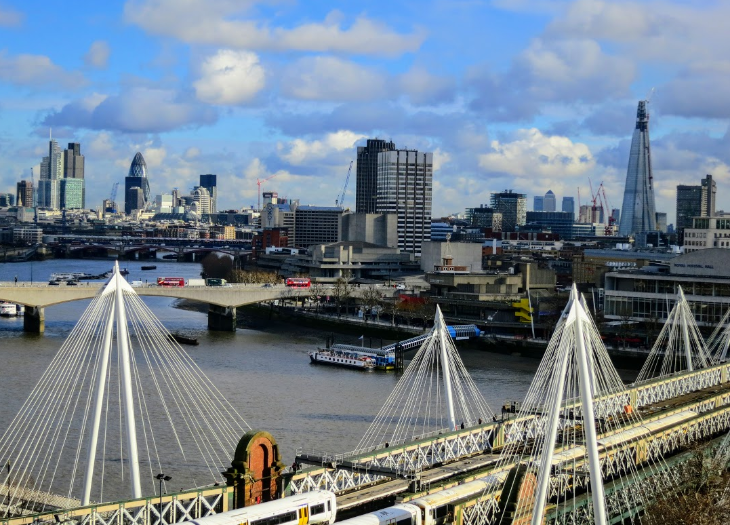 When Qantas created the first “Kangaroo route” to London in 1947, it took four days and nine stops. According to this CNN article, San Francisco-Delhi on an Air India 777 is the longest route by distance, at 9,400 miles- but due to winds, that flight could be shorter in duration. 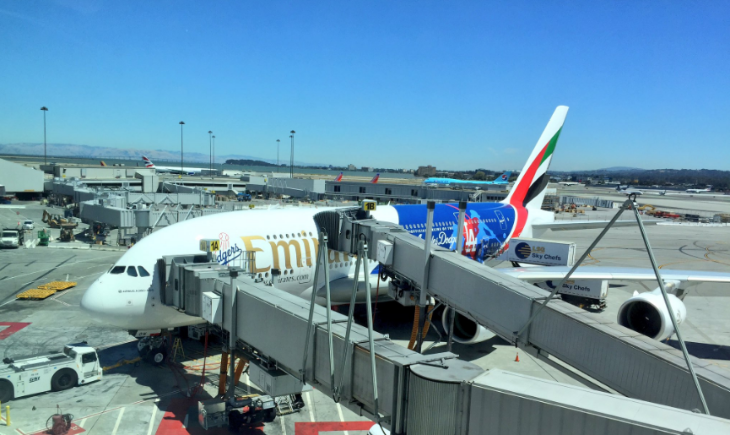 Other sources say that the current longest flight in the world is Emirates nonstop between Dubai and Auckland at 8,824 miles. Also this weekend, seats on United’s new Boeing 777-300ER, which will include the new Polaris business class seat, went on sale. Would you like to give the new bird- and that new Polaris seat a try? On February 16, United flight 443 departs SFO at 12:40 pm and arrives EWR at 9 pm. UA1920 departs Newark at 7 am and arrives SFO at 10:23 am. If you want to fly up front, a round trip Polaris business class seat on the inaugural flight from San Francisco to Newark is currently selling for a steep $3,075 one way. 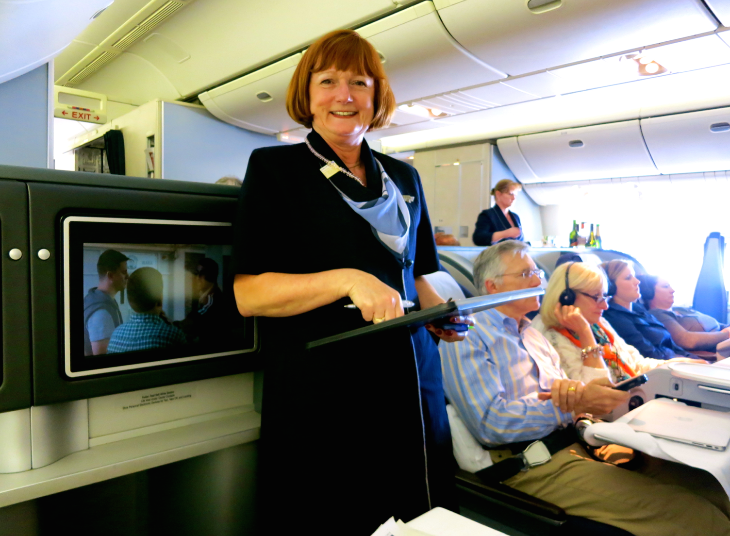 (Later in the month, the business class fare drops to about $1,500 each way.) The new 10-across Economy class is much cheaper– about $186 one way. 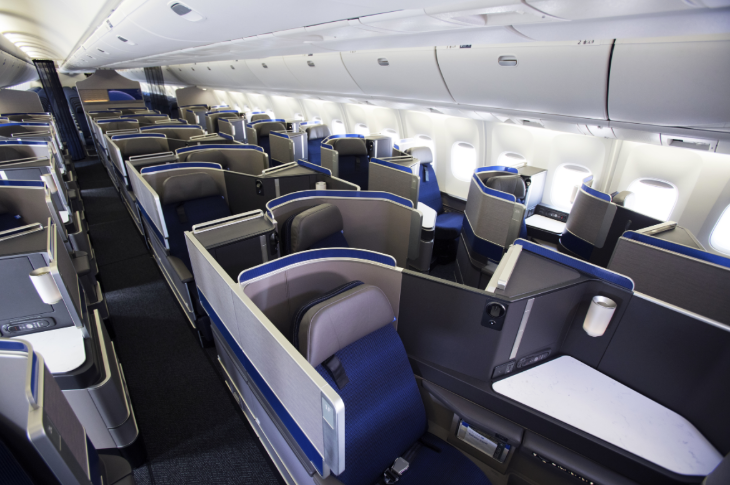 United will fly its new 777 on SFO-EWR from February 16-May 4. 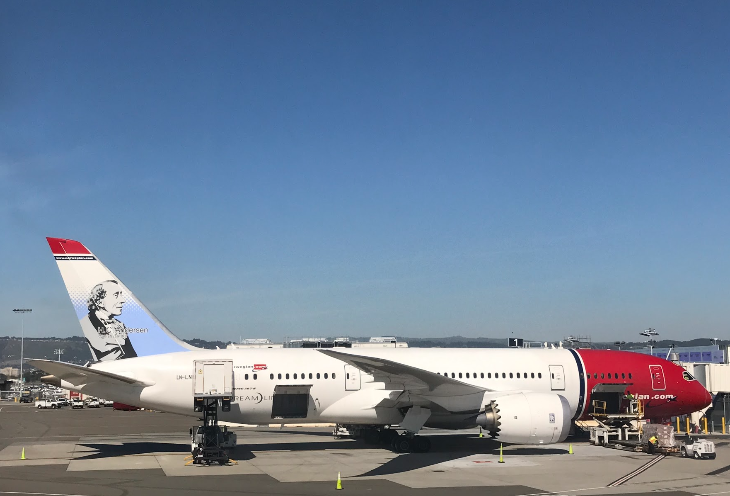 Starting on March 25, a new 777 will fly between SFO and Hong Kong. Polaris business class fares are about $2,700 each way. Economy class is running $745 round trip. When we checked on Sunday, it appeared that so far eight Polaris seats had sold on the inaugural SFO>HKG run. 7 Delta: Don’t mess with my peanuts! 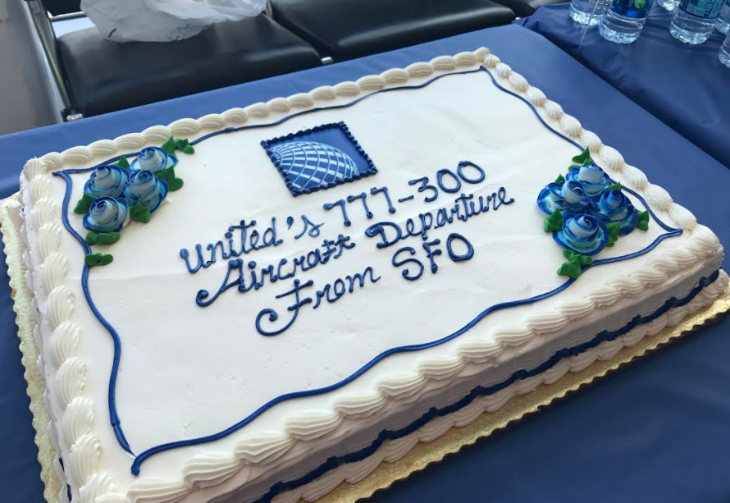 This little pig killed it this week on SFO- a PR bonanza! 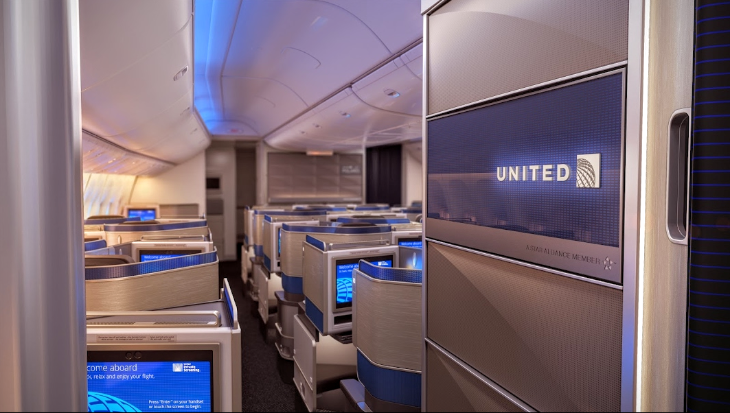 United Airlines has revealed the initial schedule for introduction of the 777-300ERs equipped with its new Polaris business class cabin, and San Francisco figures prominently in the rollout. 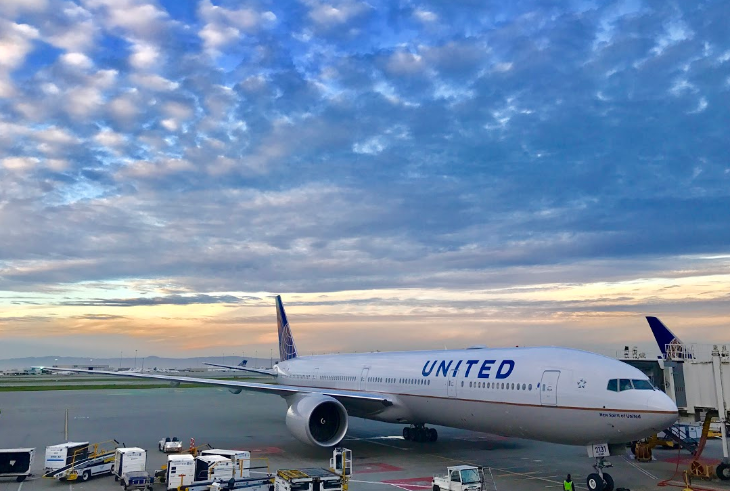 The first scheduled service of a Polaris-equipped 777-300ER will be on a domestic route, linking United’s San Francisco and Newark Liberty International hubs. The new aircraft will fly six days a week from February 16 through May 4, the airline said. 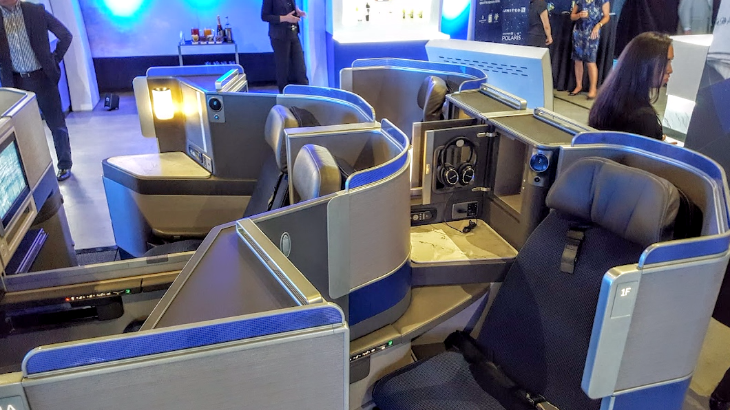 But United Polaris flyers in SFO won’t get the full experience when the new 777-300ER lands there– a spokesperson tells TravelSkills that phase 1 of the Polaris lounge will be complete by midyear, with the lounge renovation complete by the end of 2017. 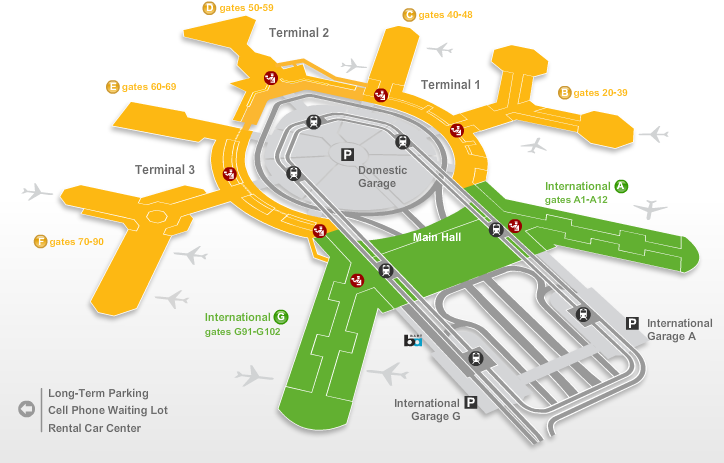 More details on the SFO lounge scene here. The new Polaris business class provides seating in a “suite-like pod,” United said, with direct aisle access for all passengers. Seats recline 180 degrees, and are 6 feet 6 inches long and 23 inches wide, with one-touch lumbar support, A/C power, two USB ports, a 16-inch high-def video screen, privacy dividers for the middle seats, mood lighting, and an electronic “do not disturb” sign. The front cabin also has a marble-topped bar where passengers can get drinks and snacks. No word yet on what the other Polaris outfitted routes will be. Satellite Wi-Fi will be available for purchase, and the economy cabin will offer on-demand entertainment via seatback screens or streaming to personal electronic devices. 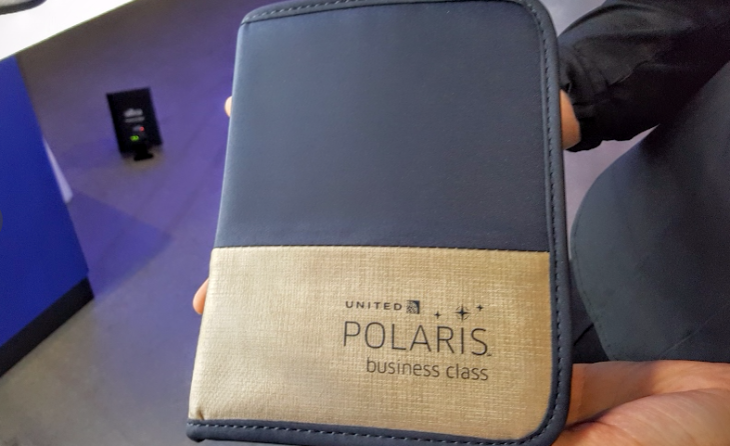 United this month started to deploy the new Polaris amenities and services for its business class flyers; here’s a post we ran last month detailing the changes. Of course, the full effect of Polaris won’t be felt until the new seats debut in February. 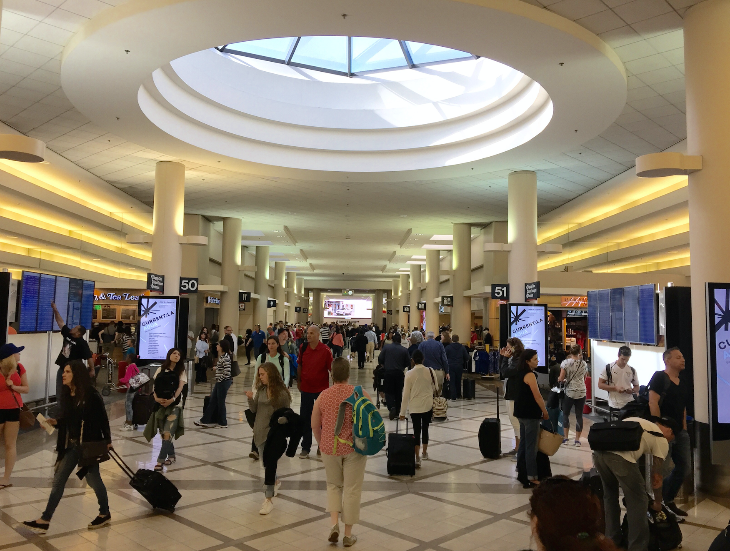 4 Is BART’s Oakland Airport rail service in trouble? Don’t miss: Fare sale to Havana, Cuba> Vamos! As you read this, United jets are taking off from Asia with the new Polaris business class product onboard- that eye-catching Bloody Mary cart is rolling down the aisle somewhere! 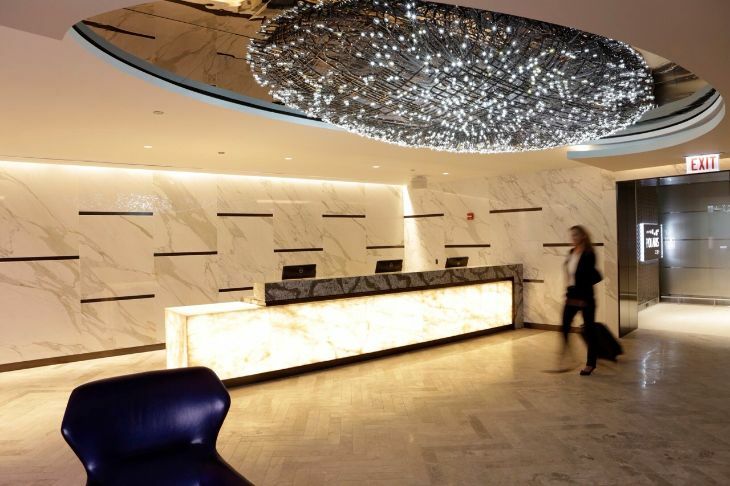 And tomorrow, the same thing will be happening on all United long-haul international flights departing the U.S. Also tomorrow, business and first class passengers will be able to lounge in United’s first Polaris Lounge at Chicago, O’Hare. “We have a hard cut over beginning on December 1. Over the past few months we’ve been designing, purchasing and shipping more than two million items which have been stored in warehouses around the world. 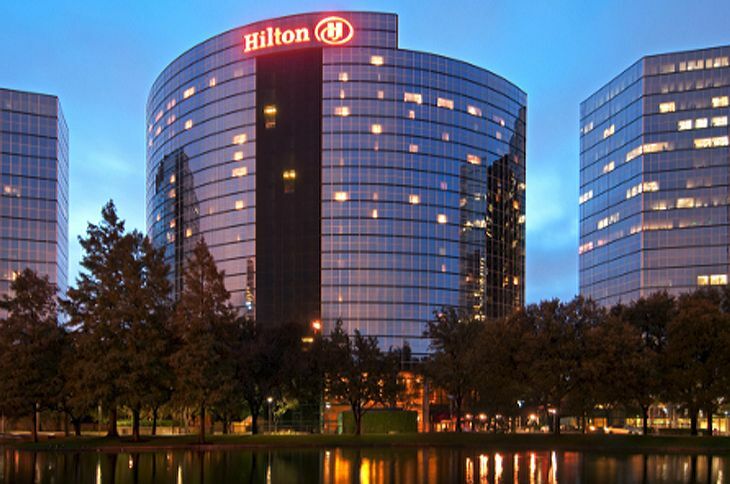 It will all be ready to go on December 1,” United’s Polaris product lead Maria Walter told TravelSkills in an interview earlier this week. 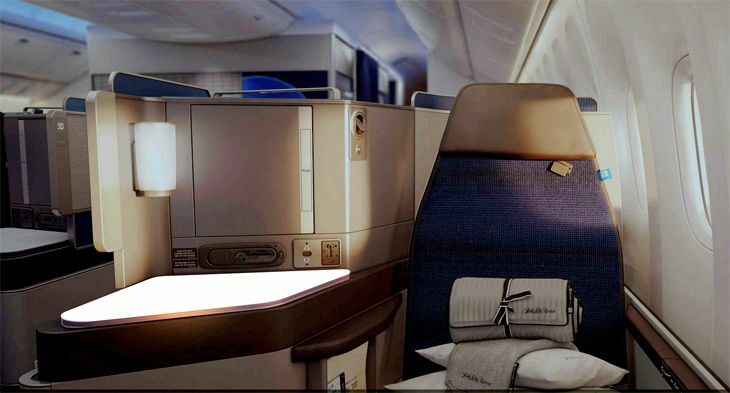 For the time being, Polaris passengers will be seated in United’s regular business class seats, but the soft product surrounding them will be all Polaris, which includes a mattress cover for sleeping, Saks pillows and blankets, pajamas/slippers on ultra-long-haul flights, big new amenity kits including contoured eye masks and new inflight food and beverage service. The new Polaris seats are going to take a while to roll out— the first seats are not expected until late February on a new B777-300ER. United says it will take up to three years for the new seats to appear fleet-wide. Walter could not provide us with any further details regarding timing or which routes will be the first to get the new seats. But she did reveal a bit of behind-the-scenes color regarding the development of the seat. 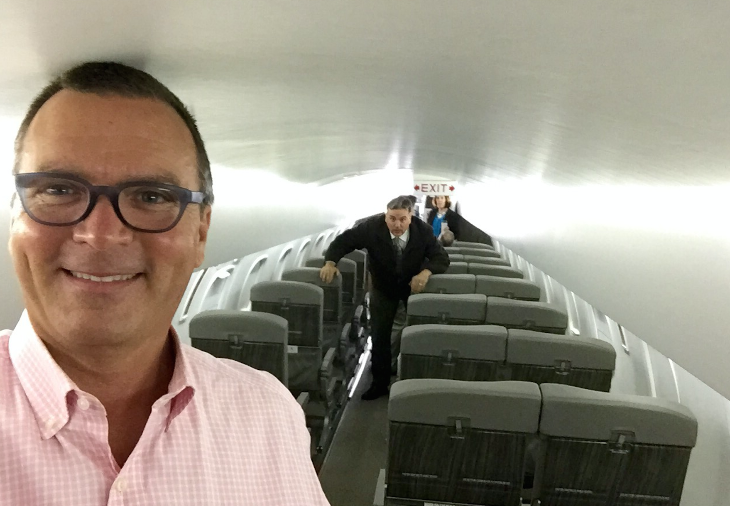 In previous interviews with TravelSkills, Walter made it clear that United’s main focus for this product was on providing the best possible sleeping experience. Through extensive customer research, United found that a good night of sleep is the one thing customers want the most, and UA has tried hard to deliver on that. From the new Polaris lounge that provides the opportunity to eat a sit-down meal prior to the flight, allowing for maximum sleeping time on board, to a comfortable new fully-flat seat/pod with enhanced privacy, and all-new bedding including and mattress pad, multiple pillows and blankets, it does look like United has done a lot to make it easier for customers to arrive at their destination well-rested. 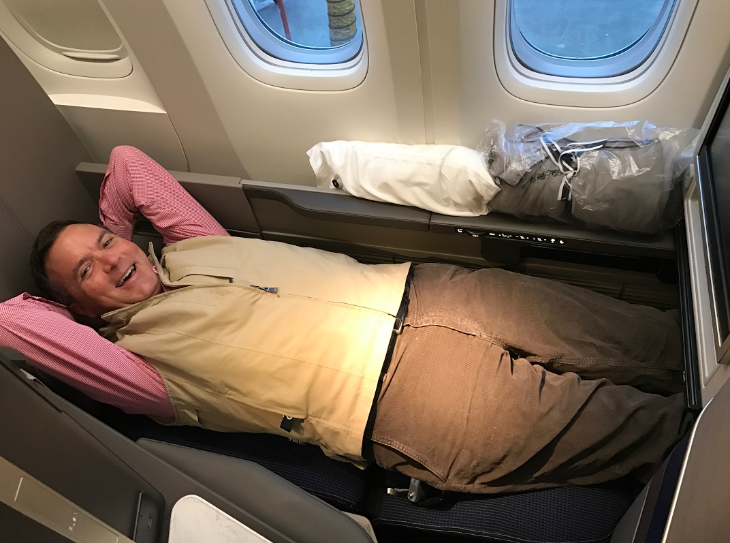 In addition to the seat, United says that bedding is another critical ingredient for providing a good sleeping environment. To that end, Polaris now includes a pretty impressive set of goods to help you get comfortable. When you arrive at your seat, there will be four pieces of bedding waiting for you — a small pillow, a large pillow, a light day blanket, and a heavier duvet. The airline says the advantage of all those pieces is that it makes it easier for customers to control their temperature, which is a common complaint. 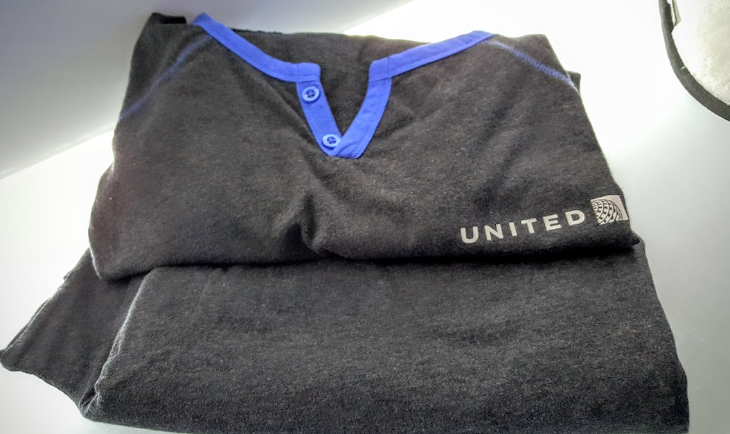 Once seated, if you are cold or tired, you can immediately use all four pieces to get warm and comfortable, without having to request anything from a flight attendant and possibly wait until after takeoff. 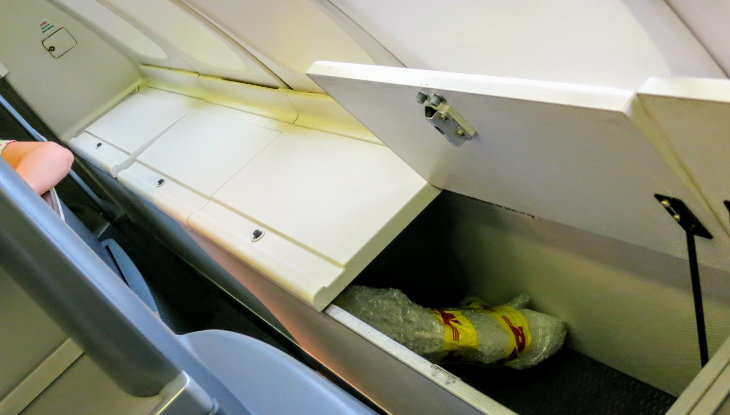 The drawback to this approach is that many customers won’t need all the pieces right away and they’ll have to find places to store everything as they settle in, but United says its research found that passengers didn’t have a hard time figuring this out. There will be a few additional items that customers may request from crew. You can ask for a cooling gel memory foam pillow as well as a mattress pad. Crews won’t actually turn down your bed for you, but they will at least give you a mattress pad so you can do it yourself. I say hooray for that, as who wants to sleep with their face pressed up against seat upholstery that thousands of other people have also been intimate with? On flights over 12 hours, you may also request pajamas and slippers. The bedding materials prominently feature the Saks Fifth Avenue brand. I told a product director that I thought the branding seemed a little gimmicky, as people don’t generally think of Saks and bedding and it just felt a bit forced. But she told me that it’s not just Saks slapping their label on these product, it’s a true partnership that has allowed United to leverage the Saks supply chain to acquire this much-upgraded bedding at the same cost as their old bedding. She also said that they liked the idea of partnering with an upscale retailer because it allows room to extend the partnership into other areas like crew uniforms and dishware. United apparently considered partnering with a hotel brand (as Delta has done with Westin) and easily could have done something with UA’s tight hotel partner, Marriott. But they felt like this type of partnership is a bit tired and constraining, so United wanted to do something different here. Waiting at your seat upon boarding will be a brand new amenity kit. I have to say, I was pretty impressed with it. The case itself is beautiful and feels very high end with a nice textured exterior, a zipper closure, and a variety of pockets inside. 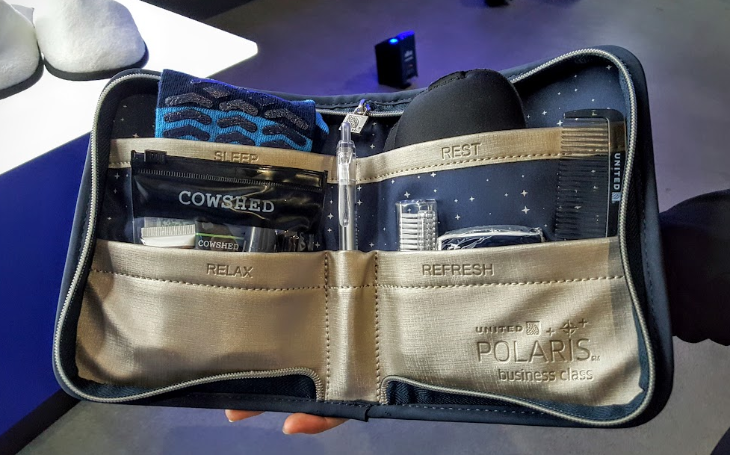 United will continue to leverage its partnership with Soho House to provide quality Cowshed products, including relaxing pillow mist, lip balm, hand cream, and towelette, as well as other standard items like eyeshade, ear plugs, socks, tissues, comb, hand sanitizer, mints, dental pick, toothpaste, and toothbrush. A couple of standout items were the pillow mist that is meant to be sprayed on one’s pillow or bedding to help you fall asleep more easily, as well as some really nice eyeshades that included a contoured foam back that fits more snugly against your eyes and blocks out more light than usual. United says it spent three years developing this new business class product and tried hard to be truly innovative, rather than just catching up and copying the competition. While in many ways this new Polaris product does finally bring United up to par with major U.S. and international competitors, it is nice to see them going above and beyond in some small and even some more significant ways. But time will tell! We look forward to hearing from travelers returning from their first Polaris voyages to see how the rubber is hitting the road. Anyone out there ready to reveal their first experience? Email us, or leave it in the comments. What do Delta and Donald Trump have in common? In Part 3 below, we’ll look at how United plans give us a better night’s sleep with new bedding and amenities. 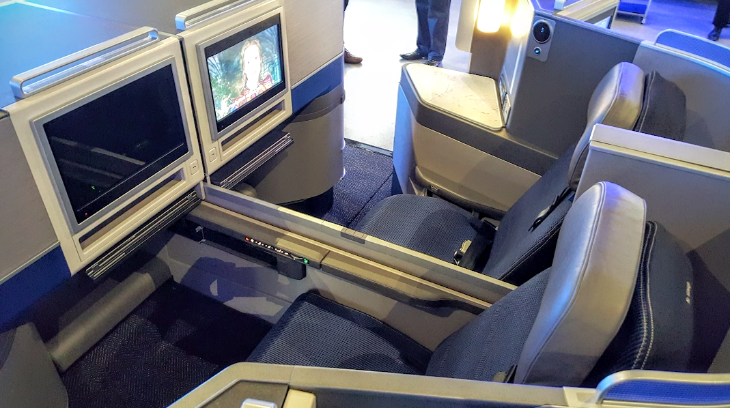 And after that we close out the series with a look at how United intends to bring together all the hard products with heightened inflight service– the true key to the success of the Polaris experience. On flights over 12 hours, you may also request pajamas and slippers. 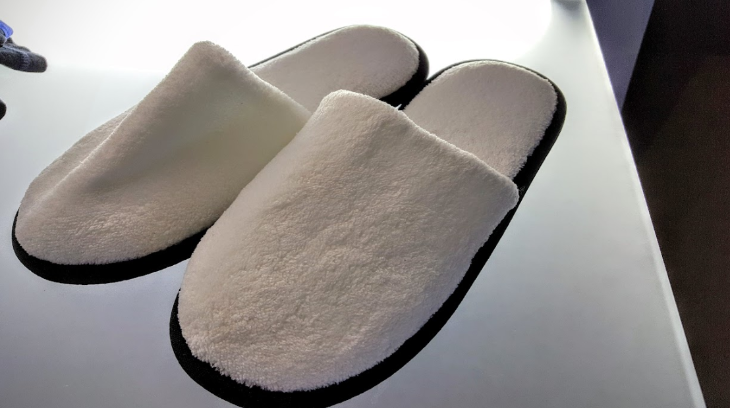 The PJs I saw seemed fine, nothing special, although the slippers felt nice and plush, higher quality than I would have expected. They also appeared as though they might fit a large American foot. 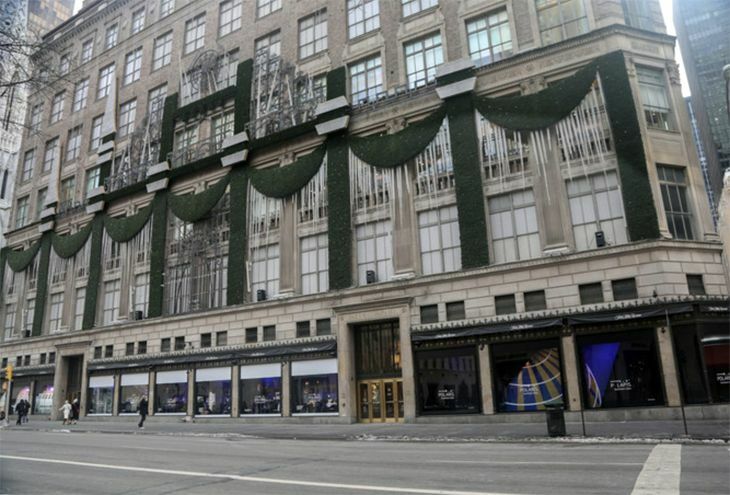 The bedding materials all felt high quality, and all prominently feature the Saks Fifth Avenue brand. 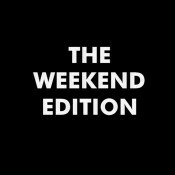 I told a product director that I thought the branding seemed a little gimmicky, as people don’t generally think of Saks and bedding and it just felt a bit forced. But she told me that it’s not just Saks slapping their label on these product, it’s a true partnership that has allowed United to leverage the Saks supply chain to acquire this much-upgraded bedding at the same cost as their old bedding. She also said that they liked the idea of partnering with an upscale retailer because it allows room to extend the partnership into other areas like crew uniforms and dishware. United knows that it can provide a great hard product, but if onboard service is lacking, it detracts from the entire experience. And service is an area where U.S. airlines generally lag considerably against the international carriers. So United is doing a few things different to try to improve service quality with Polaris. First, they heavily involved flight crews in the design of the product over the past three years. I was surprised to hear that this is apparently a new way of doing things, as I would have assumed that crews were always included in the process, but I digress. 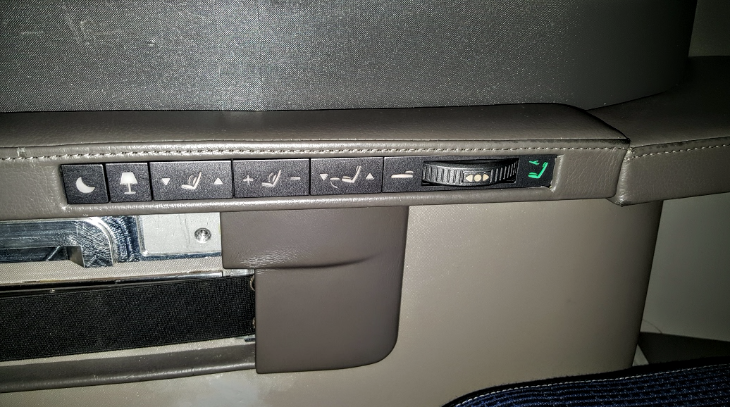 Apparently flight attendants came up with some great input, such as identifying that the reset button at each seat (which is pressed if the seats becomes inoperable for some reason) was in a very hard-to-reach location, so the feedback was shared with the seating designer and the button was moved to a better location. Similar for how catering carts are packed — flight crews pointed out that it’s much easier to unload heavy items if they are placed lower down to the floor than up high. Next, United is doing a lot more training than usual. The first phase already happened and had flight crews go through a half-day session giving them a high-level overview of Polaris — what the product is, why they are doing it, how it will impact customers, etc. This is new for United and the thinking is that if crews understand why they have this new product, they will better understand the how to execute on it. They want flight attendants to be excited about the new service and proud of the airline for stepping up and offering a world class experience. The next component involves a lot more executional training. 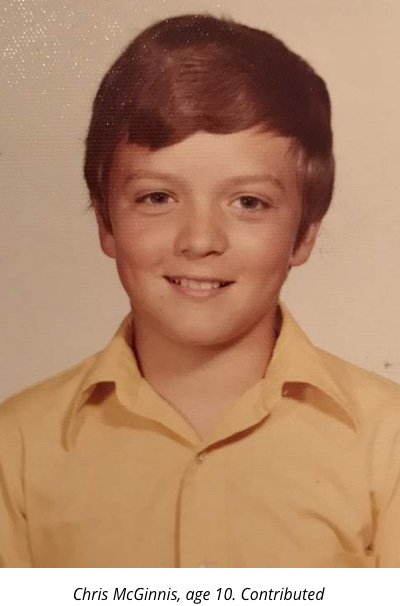 It sounds like in the past, training for a new product was largely done by computer and flight attendants simply had to answer some multiple choice questions to prove that they knew what to do. 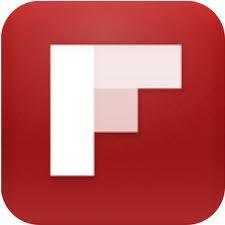 Now, the training will be more interactive and will involve more instructional videos and real-world demonstrations. 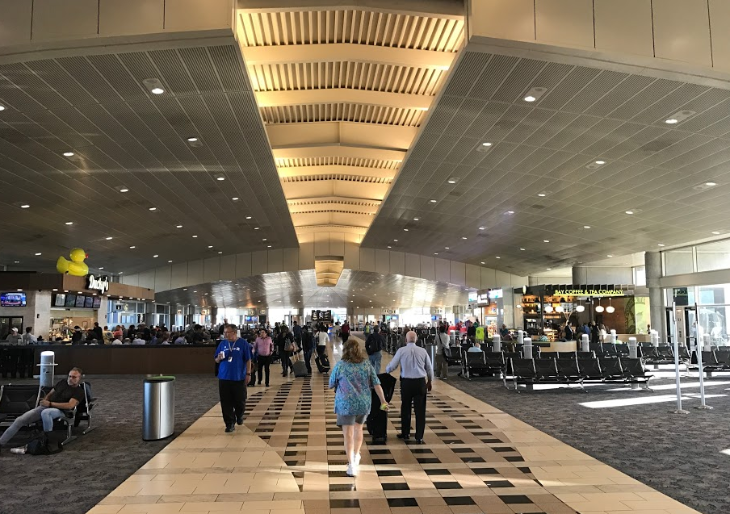 That includes having highly-trained supervisors on board Polaris flights for the first few months to oversee service delivery and to help crews work out the details. Those supervisors won’t actually be working the flight, but rather are solely on board to make sure the service is delivered as designed. This step is a first for United. That’s it for part three of our Deep Dive series on United’s new Polaris business class. Don’t miss our previous posts about the new seat (Part 1) and the new food & beverage and Polaris Lounge (Part 2)! So what do you think about United Polaris now that you’ve taken our deep dive? Please leave your comments below. We can’t wait to slip into the real thing this winter. Stay tuned for that Trip Report! This series was written by TravelSkills contributor Scott Hintz. Check out Scott’s other amazing contributions here. This is Part 2 of our Deep Dive series about United’s much anticipated new Polaris business class which will debut in December. The fleetwide rollout is expected to take about three years. In our previous post (Part 1), we focused primarily on the new seat. 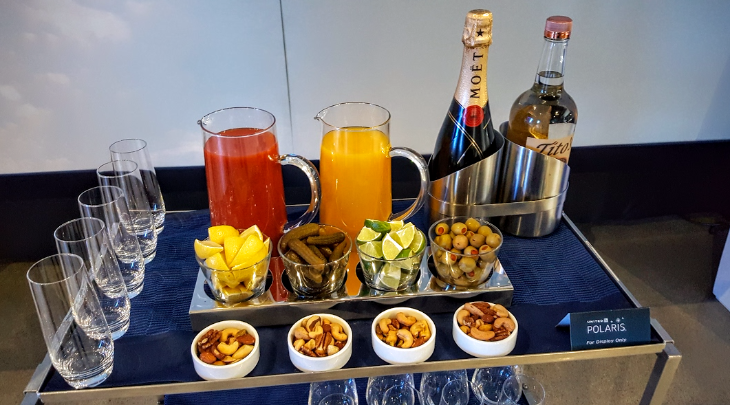 In this post we’ll look at the new food and beverage offerings and take a peek at what Polaris business class lounges are all about. United is making a big deal of its partnership with the Charlie Trotter group to come up with restaurant-inspired menus, although there weren’t many specifics in terms of the food that will be served. It sounds like they partly want to keep it a secret, but also that the food is still being developed and hasn’t been finalized. But apparently UA will introduce more variety into its menus, offering more regionally-specific meals than in the past. For example, the airline previously considered China a single region and offered the same menu on all flights departing China, but now realizes that cuisine varies widely from city to city and will offer a different menu from each of the airports it serves in China. 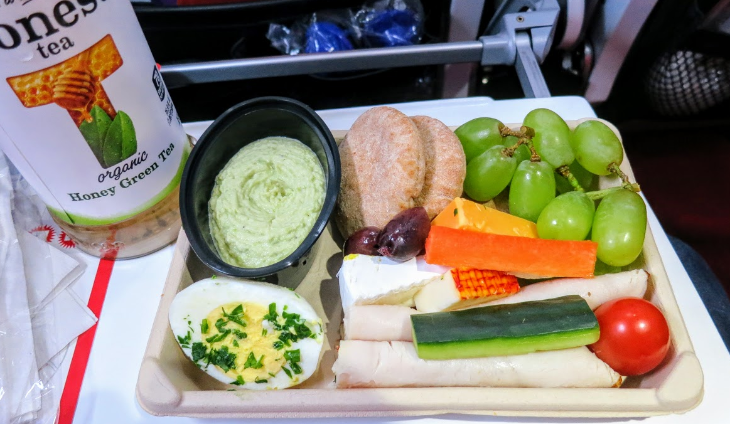 It sounds like the entire U.S. will have the same menu for originating flights, but different food will be offered across various cities for European departures. When I asked about providing healthier options, a spokesperson said that they are definitely keeping that in mind, but couldn’t promise anything specific other than that they will begin offering a fifth entree option on all flights, which will be a salad with a warm protein. 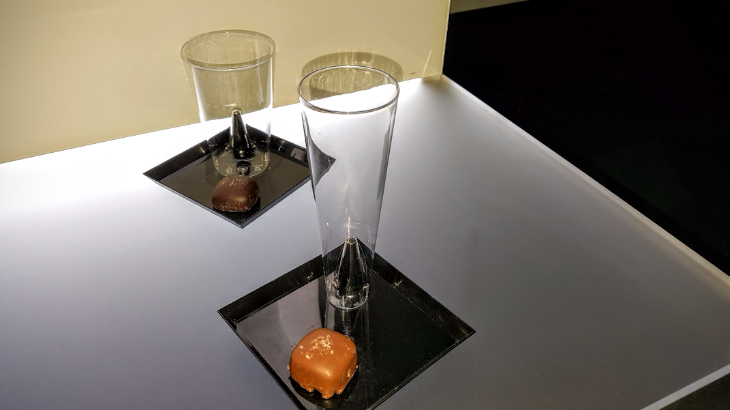 For pre-departure beverages, Polaris will now have an integrated design where a plastic cup will be slid onto a post that’s part of the plate that will feature a welcome-aboard chocolate. United will be serving real champagne from Pouilly-Fuissé in addition to water and juice choices. In terms of new, unique service features, United will begin offering a bloody mary cart for flights departing before noon. Flight attendants will wheel a cart down the aisle and allow customers to customize their bloody marys — in the words of a United product lead, “if someone wants 10 olives in their drink, they can have 10 olives.” For flights departing after noon, in lieu of the bloody mary cart, Polaris will feature wine tasting flights. For wine selections, the airline says it will focus on offering some up-and-comers who you may not have heard of, in addition to some classics that are more familiar. But the wine lineup will be consistent across the globe. So if UA is featuring a Greek “up and coming” wine, that will be offered on all flights around the world. Introducing a little fun on the dinner tray, the salt and pepper shakers are both plastic globes that mimic the United logo design. 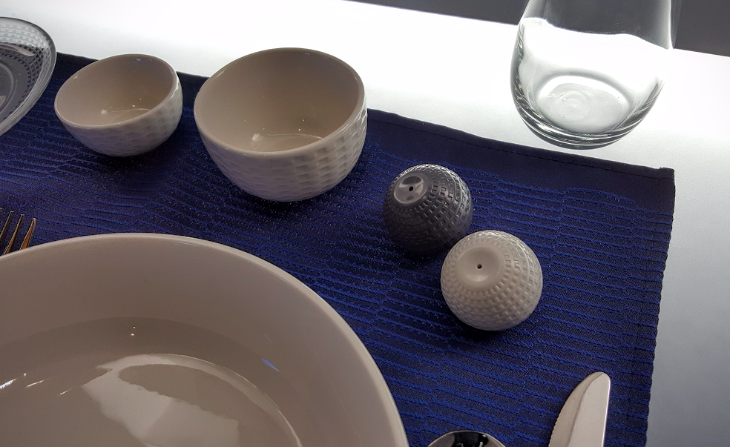 United folks jokingly refer to the pepper shaker as the “death star” and the salt as “the golf ball.” I could see these as being great gifts to take home to loved ones after a big international trip. Finally, United says that flight attendants are being trained much more extensively on the food and wine service so they are more knowledgeable about the offerings. And they’ve also re-designed some of the service to be more efficient (such as serving the appetizer and salad at the same time on a single tray instead of as separate courses, as is done currently), for a couple of reasons. First, that should make the meal service go faster and allow passengers more time for sleeping, a top priority of the Polaris experience. 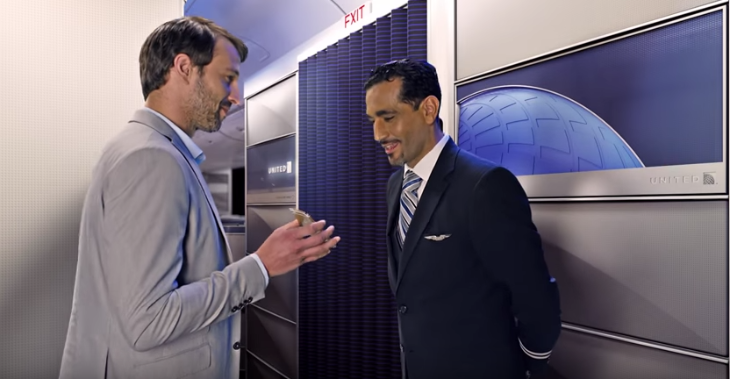 Second, it should free up flight attendant time to spend more effort on new elements like the wine tasting flight, where the crew can chat with customers and tell them the story behind the wine and have it be more of an interactive experience. Sounds great in theory, but will be interesting to see if this pans out in reality. 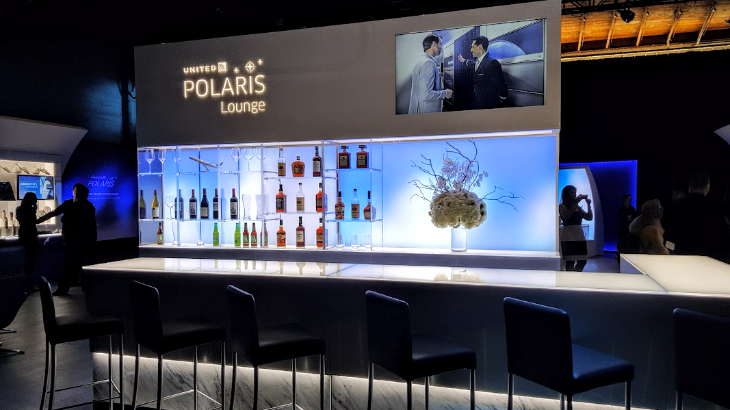 Another important component of the Polaris experience involves a new business class lounge that will be offered at nine of United’s largest stations for international flights. United says they believe they will be the only U.S. carrier with a true business class lounge. 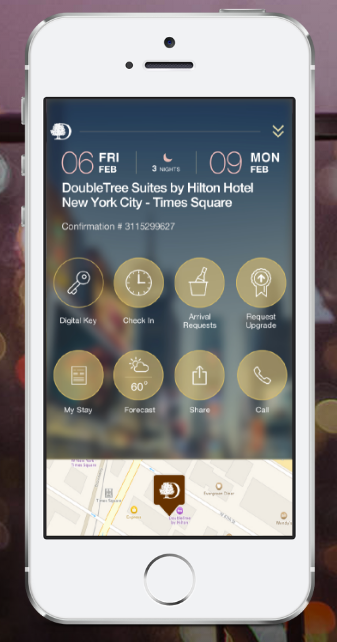 The Polaris lounge will include a few features that do stand out from the competition. 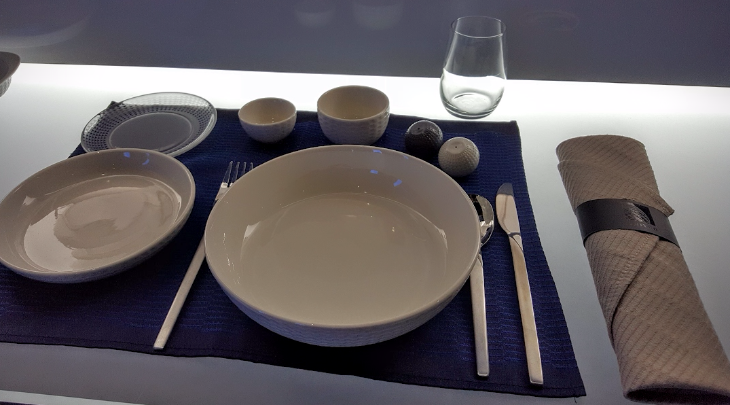 First, as previously mentioned, customers can have a sit-down meal with waiter service if they wish to eat prior to the flight, so they can maximize sleep while on board. There will also be an upgraded buffet of “premium” hot and cold food, although no specifics were given at this time. 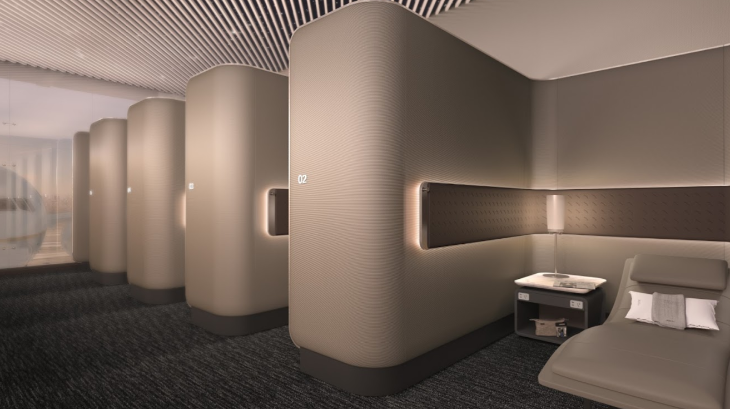 The next is a series of sleep rooms that will include chaise lounges and offer a quiet place to relax between flights. 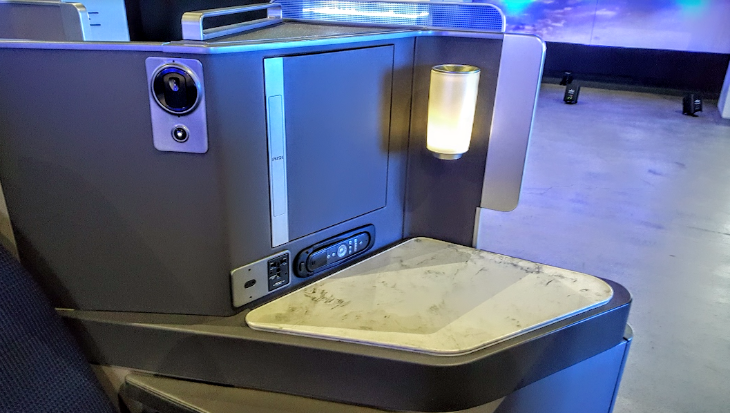 A product spokesperson said that United actually considered adding a spa to its Polaris lounges, but ultimately decided it was a liability because so many customers are disappointed when they can’t get an appointment. I actually agree with UA, as it’s nearly impossible to get into the British Airways spa as a business class passenger, and I’ve also has challenges when flying Etihad, Virgin Atlantic, and JAL, even as a first class passenger. While I wasn’t able to see a real-world sample of what the lounges will look like, United was offering a very slick virtual reality tour of them during this press event. And the virtual tour certainly did make the lounge look great, but I’d reserve final judgement until we see the real thing. And speaking of seeing the real thing, the first Polaris lounge will open Dec. 1 at Chicago O’Hare. 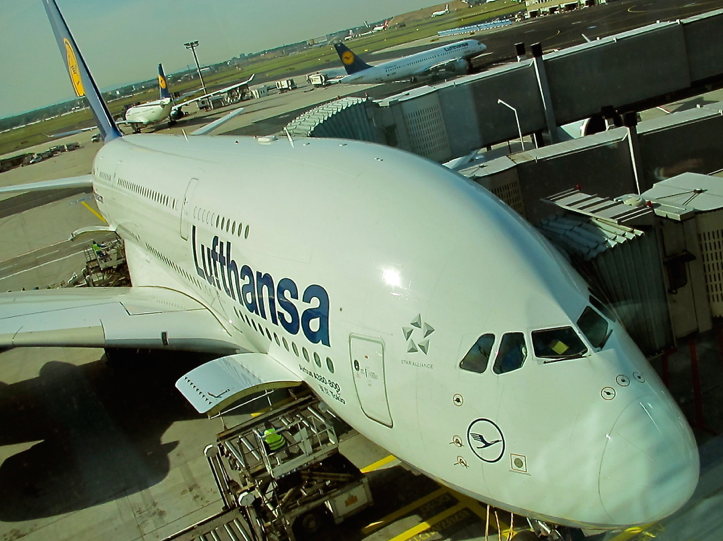 There will be 9 lounges in total, including Chicago-ORD, Houston-IAH, Los Angeles-LAX, Newark-EWR, San Francisco-SFO, Washington Dulles-IAD, Hong Kong-HKG, London Heathrow-LHR, and Tokyo Narita-NRT. That’s it for part two of our Deep Dive series on United’s new Polaris business class. 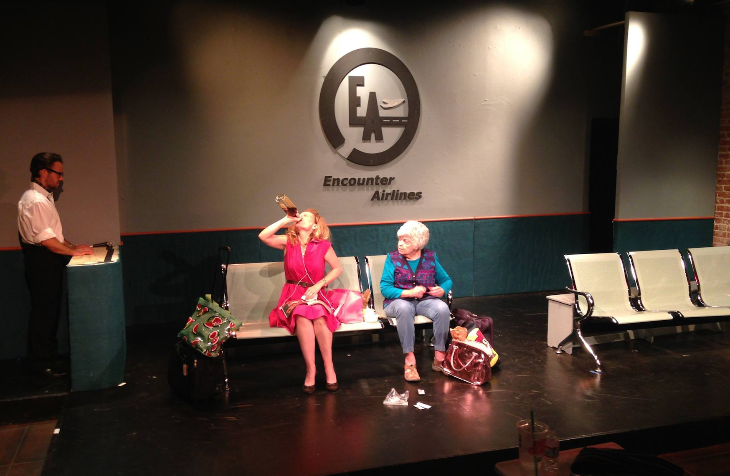 Next up we will look at bedding, amenity kits, inflight service, and more. Come back! 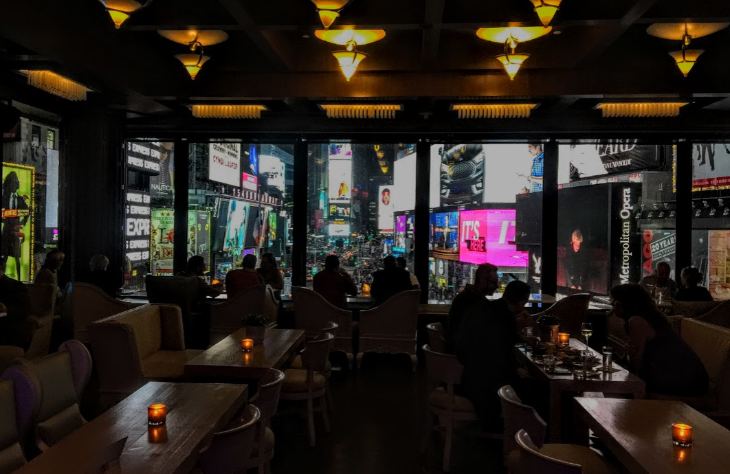 This post was written by TravelSkills contributor Scott Hintz. Check out Scott’s other amazing contributions here. 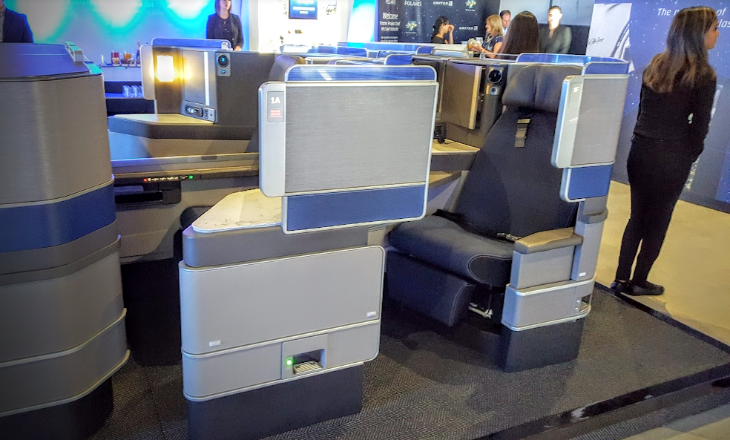 This week I had a chance to preview United’s new “Polaris” business class in San Francisco. 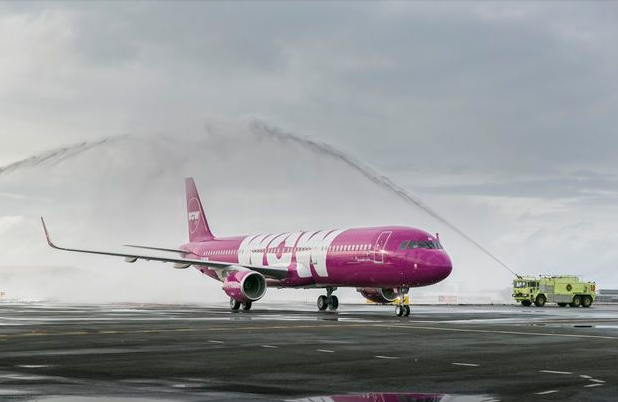 The airline is putting a lot of effort into this new product, including a roadshow to its major hubs to show it off to press, top tier Global Services flyers, and major corporate accounts. 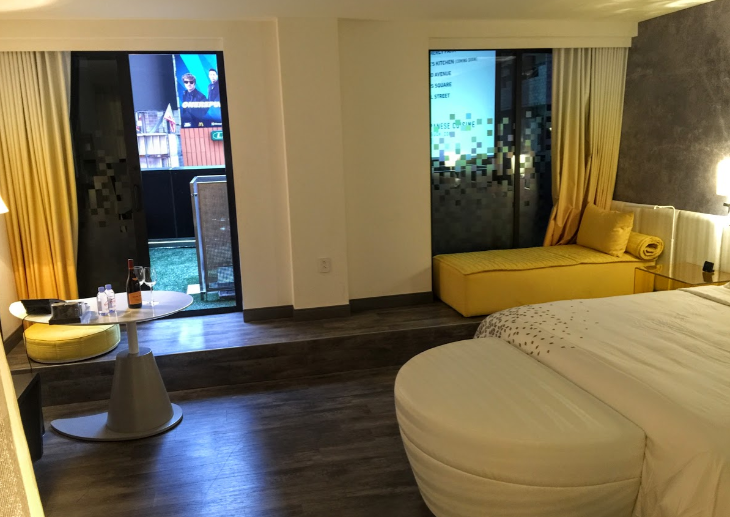 United built a mockup of the new cabin inside a studio in the edgy Dogpatch neighborhood of SF, which gave the whole event a hip, innovative vibe compared to a more traditional location like a hotel ballroom or even United’s large facilities at SFO airport. And that was fitting for a product where United has clearly put a lot of thought into being different and not simply copying its competition. All of the features of the new Polaris product will roll out system-wide on December 1, except for the new seat, which will be retrofitted to the fleet over a 3-year period. But the new food, bedding, and amenity kits will be on all business class flights later this year. United says they spent three years developing this new business class product and tried hard to be truly innovative, rather than just catching up and copying the competition. And it shows. While in many ways this new Polaris product does finally bring United up to par with major U.S. and international competitors, it is nice to see them going above and beyond in some small and even some more significant ways. 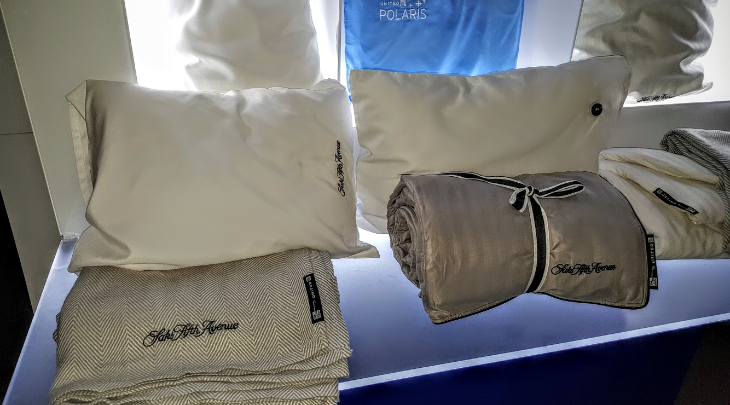 In speaking with the lead product director for Polaris, it was clear that United’s main focus for this product was on providing the best possible sleeping experience. Through extensive customer research, United found that a good night of sleep is the one thing customers want the most, and UA has tried hard to deliver on that. From a new airport lounge that provides the opportunity to eat a sit-down meal prior to the flight, thereby allowing for maximum sleeping time on board, to a comfortable new fully-flat seat/pod with enhanced privacy, and all-new bedding including and mattress pad, multiple pillows and blankets, and additional amenities, it does look like United has done a lot to make it easier for customers to arrive at their destination well-rested. 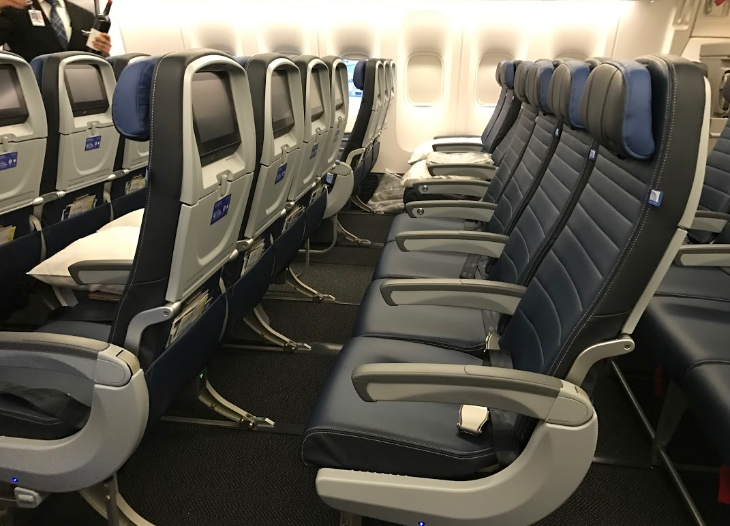 At last, United will be offering a lie-flat bed with all-aisle access, similar to what American and Delta already offer throughout most of their fleets. While it’s nice to see UA catch up to its U.S. peers, it’s worth noting that this hard product will be better than what many international carriers, such as British Airways and Emirates, offer on all or most of their planes. 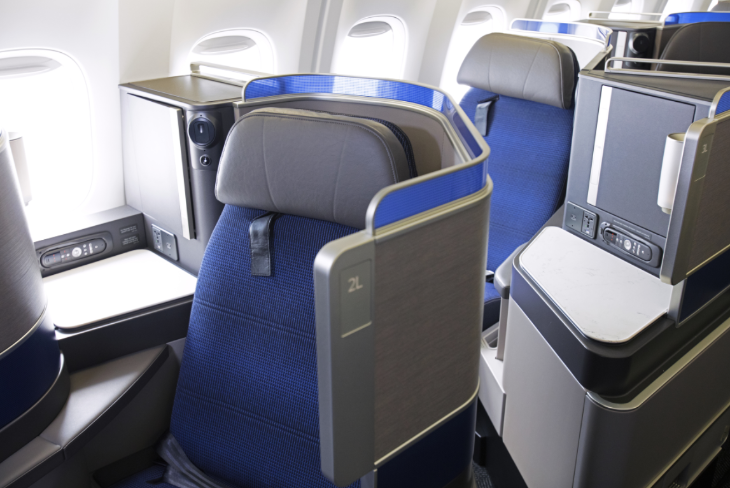 United developed this seat in partnership with a design agency, Boeing, and a seat manufacturer. They say that the unique layout allows them to fit the same number of business class seats into the cabin as their old/current product, without taking up any extra space. They claim that if they had used a product similar to what American has on the 777-300 and Delta has on the A330, the wasted space of that design would have required United to remove 6-8 business class seats from the cabin, or 24-40 seats from the economy cabin, just to fit into the same amount of space. If this is true, UA might have found the holy grail of delivering a seat that is a great customer experience at a cost/efficiency level that allows UA to offer it at lower prices than the competition and/or at higher margins. My first impression of the seat was quite good. 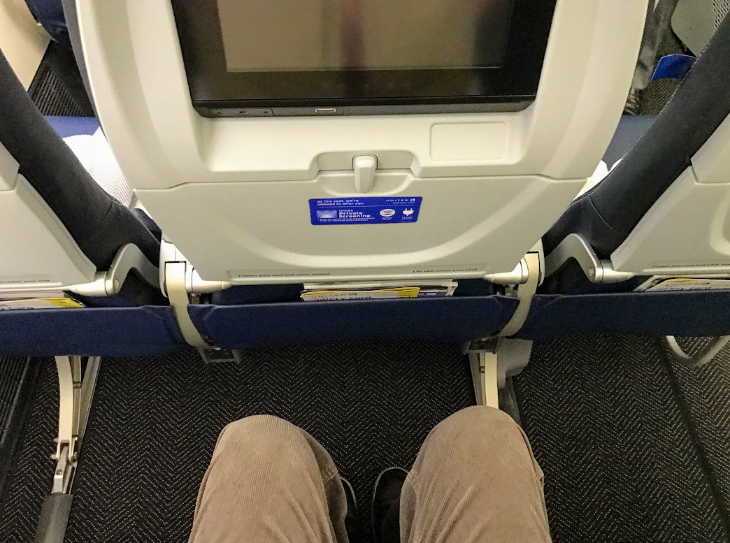 Although it’s hard to say for sure how good the seat is when you only sit in it for 20 minutes versus 12 hours, it felt comfortable, private, and spacious (enough). When Polaris was first unveiled a couple of months ago, reaction seemed to be centered around the seat layout looking very tight, and I shared that concern. But sitting in the actual seat in a mock layout of two rows of the cabin, it felt more spacious than I was expecting. However, the seats in the mock-up did not recline, so I don’t yet have an opinion about the lie-flat space. 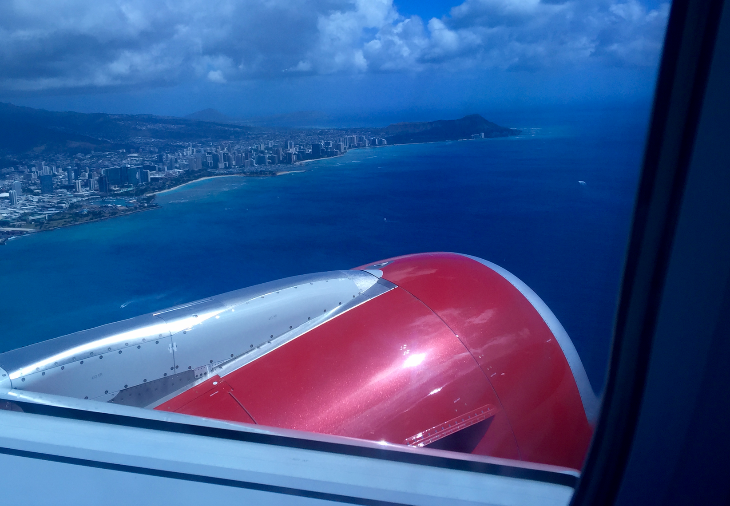 It certainly felt like more space than something like American’s updated 777-200 business class, and maybe about the same as the Delta A330 and American 777-300ER. Polaris will have a 1-2-1 configuration, with each alternating row being a bit different. For the single seats along the windows, one seat will be closer to the window and the next row will have the seat closer to the aisle. It’s reminiscent of AA’s and DL’s updated 767-300 cabins in that way, but different in that the United seats still maintain the pod-like feel of the AA 777-300 and DL A330. It’s similar for the two seats in the middle, where one row will have the seats closer to the aisles, and the next row will have the seats closer to the middle of the aircraft. Those two seats in the middle section that are closer to the middle would be great for a pair traveling together, and both seats face forward and you can easily look at the person next to you, if you have the divider down. 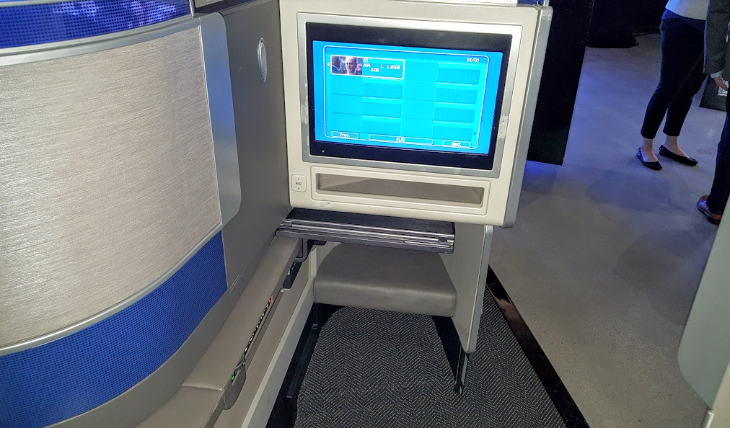 I was pleased to see that the divider will be in the up position when you board, providing a nice amount of privacy and avoiding the social awkwardness one experience when having to keep putting the divider up in BA’s Club World cabin. Looking at the cabin layout, it felt to me like the seats that are further away from the aisle (both the single seats along the windows and the side-by-side seats in the middle section) were more private, so would be my preference if flying Polaris. The seat has nice finishes and feels upscale. United went with a cloth upholstery, as they found in their research that customers don’t like leather (they’re looking at you, Delta). There was the standard assortment of power ports and lighting that one would expect. Storage also feels fairly typical with a door that opens near your head to reveal a storage compartment, plus a few little pockets down lower. A nice element is that the large monitor is in a fixed position facing you as you sit in the seat, which seems nicer than the type that you have to pop out of a wall on a hinge like you find on AA and BA. Additionally, United says this setup will give customers gate-to-gate use of the entertainment system. 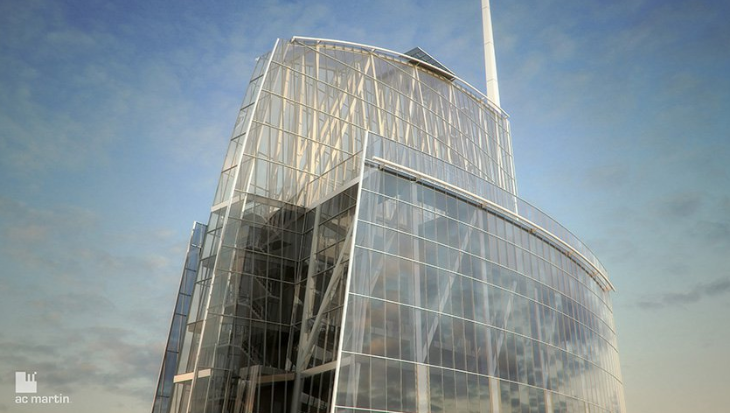 The pod includes several neat, novel features. One of the side tables in the pod is finished with a real “stone” surface. United says it’s a stone polymer composite, but it does indeed use real stone. To me, it felt a bit more like plastic than stone, but kudos nonetheless for at least trying to incorporate some natural materials in the design. 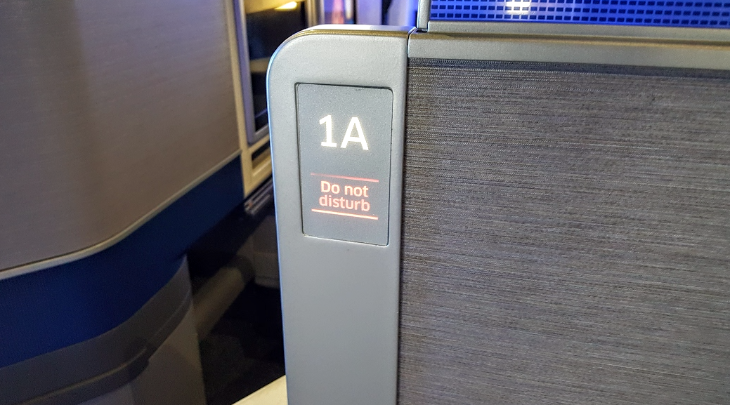 And from the no-brainer department, United has included a “do not disturb” sign at each seat, so you can let the flight attendant know not to bother you for anything. It’s such a simple feature, I don’t know why all airlines aren’t doing this. Adjusting the recline of the seat is done primarily through a simple dial feature that worked well for me. Finally, it’s nice that the tray table easily slides out from underneath the monitor in front of you, as opposed to some of the judo origami tricks it takes to unfold some trays from armrests without accidentally chopping off a finger. 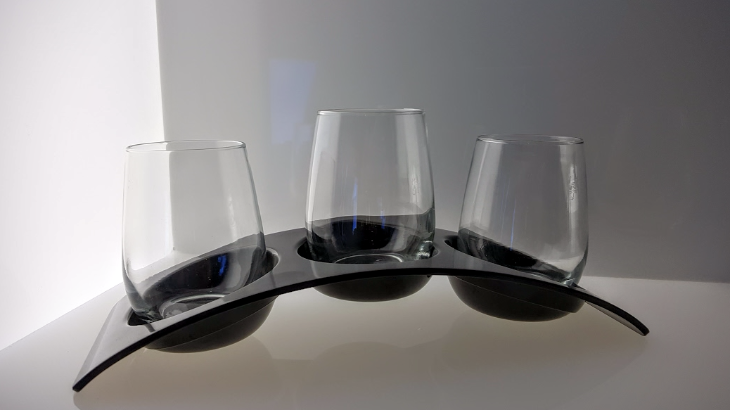 Furthermore, United showed me how you can slide the tray forward far enough to get out of your seat even while you might have some used dishes still on your tray. At last, no more feeling like a hostage while you wait for the flight attendants to clear your plates! The tray also has a little extendable “lip” near the back so you can easily prop up your iPad or other tablet if you’re using it to watch a movie — smart. United says that a unique characteristic of their Polaris seat is that it will be easy to get in and out of it even while it’s in the fully reclined position. I did test that out and found it to be accurate, but it’s hard to recall if it’s really that much more difficult from competitors’ seats. 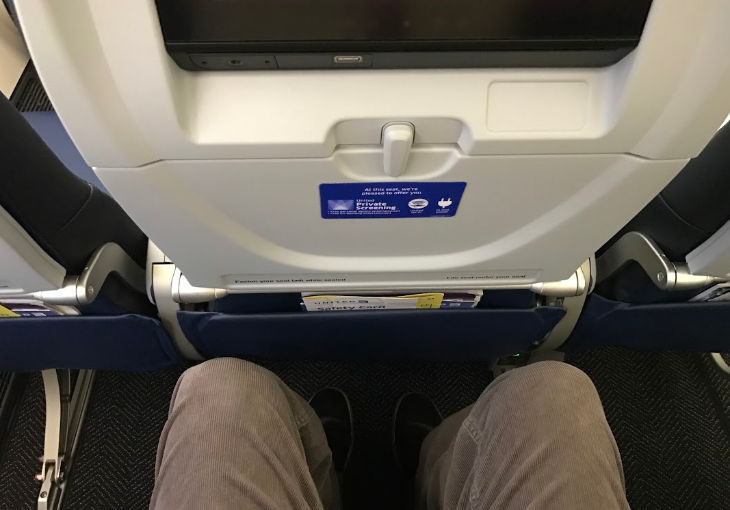 A United spokesperson said that you have to basically return the seat to the full upright position in order to get out of it on some other airlines. I know this to be largely true on British Airways, especially if you are in a window seat and have walls on both sides of you, but can’t say how much more broadly this dynamic applies across the industry. That’s it for part one of our Deep Dive series on United’s new Polaris business class. 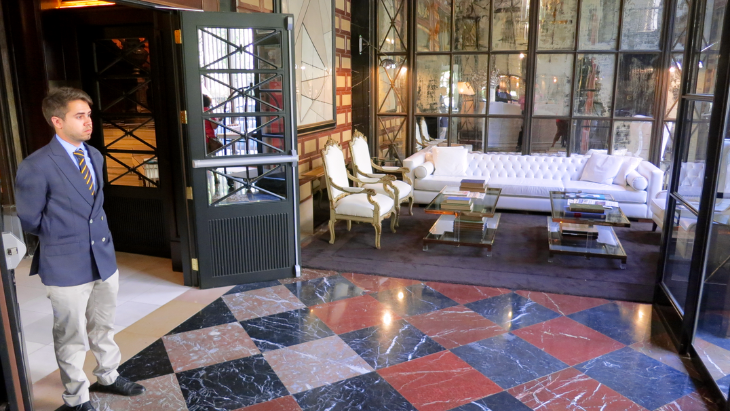 Next up we will look at bedding, amenity kids, food and beverage, inflight service, a new lounge and more. Come back! Last December, American Airlines said it would introduce an international premium economy cabin, and now it has set the date when customers will begin to see that new seating option. 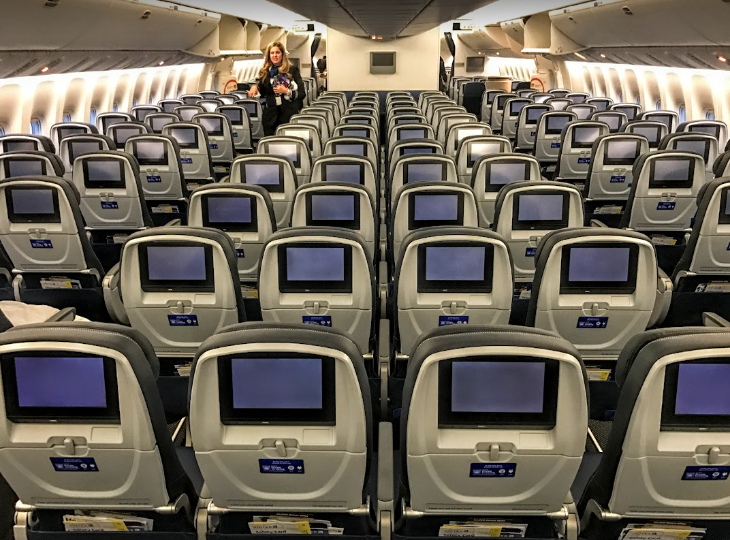 The move by American marks a new era for major U.S. carriers and is just one more step in the long-term reconfiguration of long-haul aircraft as the traditional first class cabin continues to disappear. American said that on November 4, it will start flying 787-9 Dreamliners equipped with the new premium economy cabins on routes between Dallas/Ft. Worth-Madrid and DFW-Sao Paulo. Seats can be booked starting July 10 (so no fare info yet). The aircraft will have 30 lie-flat business class seats arranged 1-2-1; 21 premium economy seats in a 2-3-2 configuration; 21 Main Cabin Extra seats (up to six inches of extra legroom) arranged 3-3-3; and 207 regular economy seats, also in a 3-3-3 layout. The premium economy section will offer leather seats with 38 inches of pitch; extendable foot, leg and head rests; and on-demand entertainment systems with larger touchscreens. 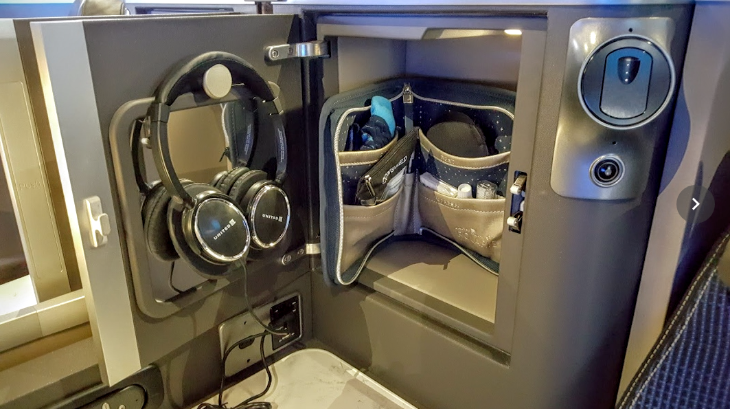 Premium economy passengers will get to check one bag free, and will receive noise-reducing headphones, amenity kits, and an enhanced meal service with free alcoholic beverages of their choice. 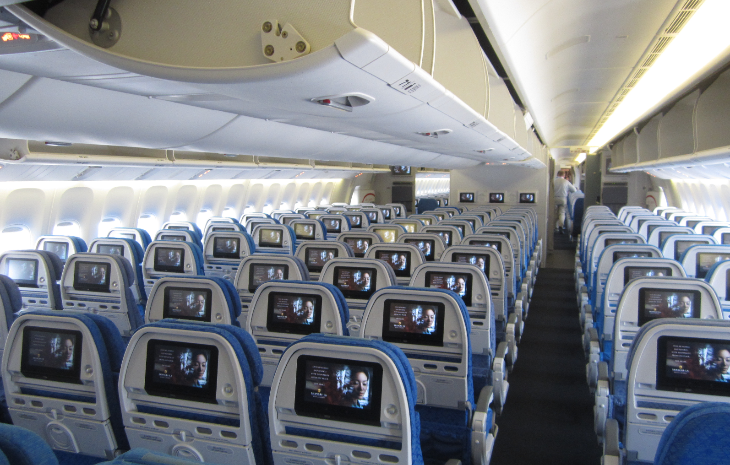 The new AA 787-9s will also offer international Wi-Fi. Besides the new 787-9s, American plans to retrofit its existing wide-bodies with the new cabin over time. U.S. carriers are behind their foreign counterparts in adding true premium economy sections to their long-haul aircraft. 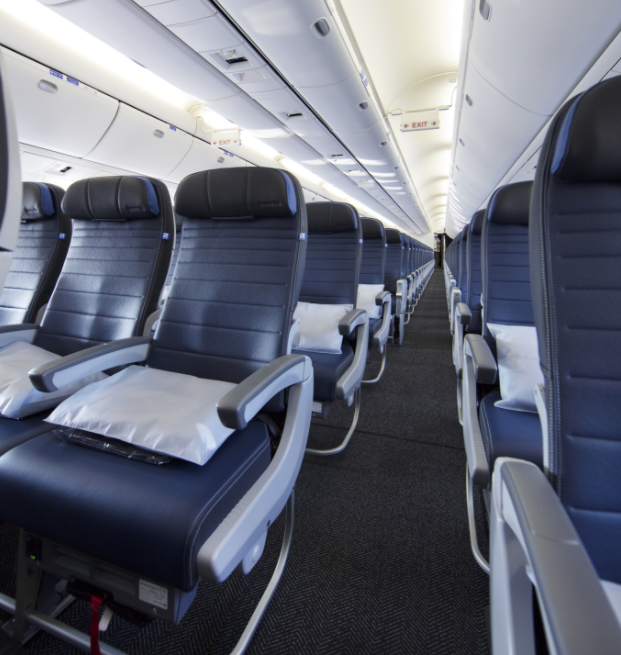 According to Seatguru.com, which has compiled a comparison chart of premium economy seating worldwide, some 28 foreign carriers already offer the service. 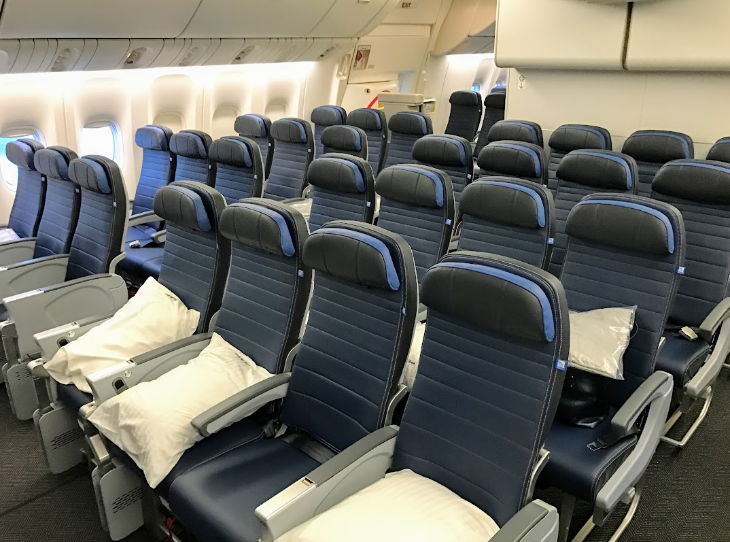 American’s status as the only major U.S. carrier to offer international premium economy won’t last too long, however; Delta has already said it plans to introduce premium economy seating on the new Airbus A350s that it will start adding to its fleet in 2017, and then will extend the new cabin to its 777s as well. All this is putting pressure on United Airlines to follow suit, but so far that carrier hasn’t said anything about premium economy. United’s last big announcement about its long-haul fleet was its plan to install an all-new Polaris Business Class product, which will start to appear in December on its 777-300ERs and then on its new 787-10s and A350-1000s; the new business cabin will also be deployed on United’s 767-300s and 777-200s as part of a three-year project that will also mean the gradual elimination of first class service on the airline’s long-haul fleet. And United’s not alone in that respect; we recently noted that a number of the world’s leading airlines are moving to eliminate traditional first class as they buy new aircraft and retrofit their older ones. 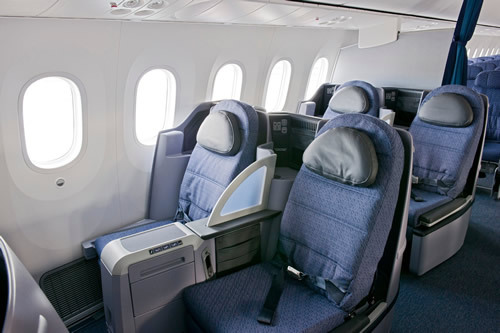 Think of it as a gradual recycling of cabin classes, with newer, plusher business classes replacing traditional first class, and improved premium economy seating taking the place of traditional business class. 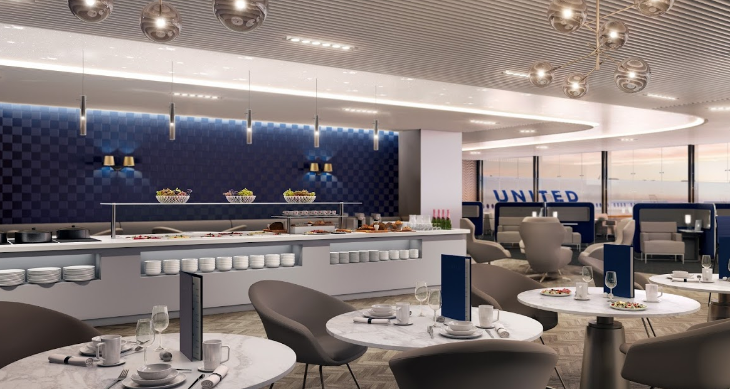 December 1 is the launch date for what United Airlines is calling a ”reimagined international travel experience” – the carrier’s long-awaited new business class, which will come with some new airport lounges as well. United is calling the new cabins “Polaris Business Class” and they’ll start to appear in December on the airline’s 777-300ERs, and later on its new 787-10s and A350-1000s. 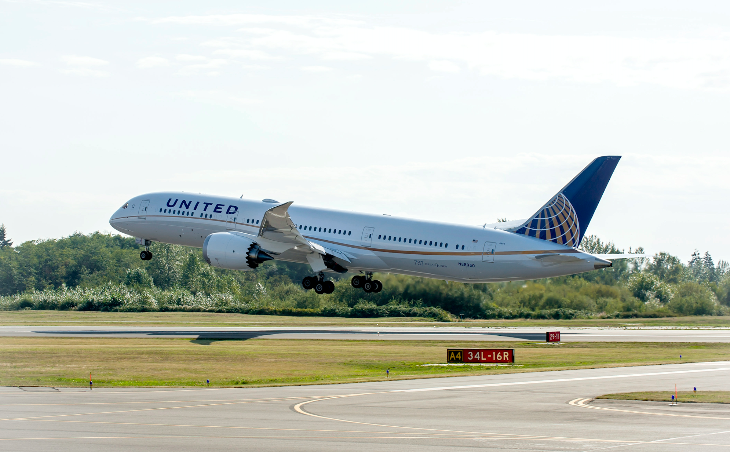 United said its 767-300s and 777-200s will be retrofitted with the new cabins and that the fleet-wide retrofit is a “multi-year process” that we expect to take up to three years. 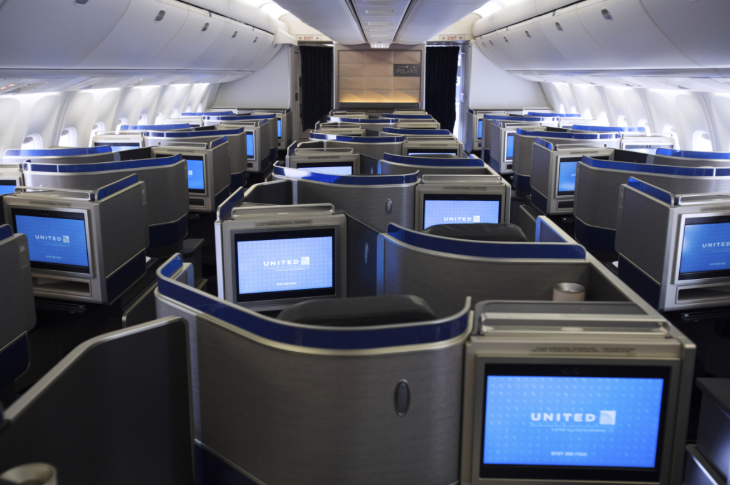 United’s current first class product will disappear with the retrofit. So will those controversial rear-facing, four-across BusinessFirst seats. 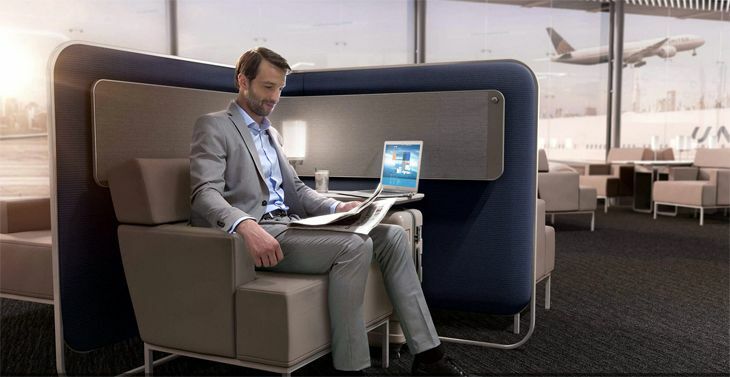 Also on December 1, United will cut the ribbon on a new Polaris business class airport lounge at Chicago O’Hare, the first of nine such installations. 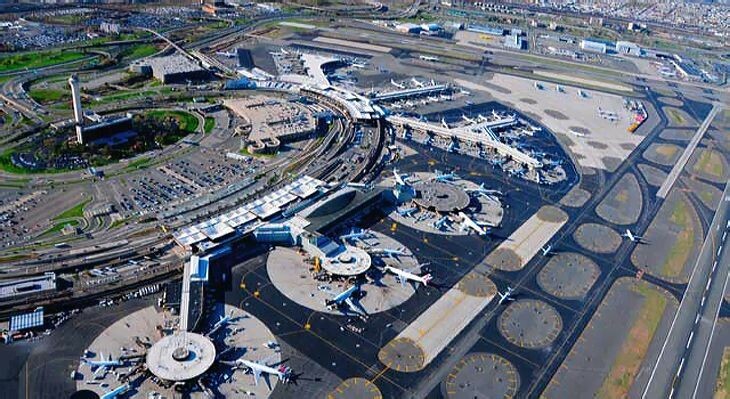 Others will be coming at Los Angeles International, San Francisco, Houston Bush Intercontinental, Newark, Washington Dulles, Tokyo Narita, London Heathrow and Hong Kong, United said. For those traveling with companions, the two seats in the center of the cabin will have electronic privacy dividers. 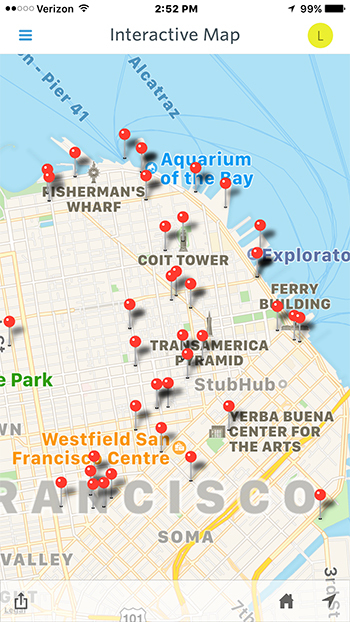 And another nice touch: All seats have toggled do-not-disturb notifications. Other enhancements to business class will include new custom-designed luxury bedding from Saks Fifth Avenue; free pajamas and “cooling gel filled pillows” on flights longer than 12 hours; new amenity kits; and upgraded in-flight menus and wine selections. 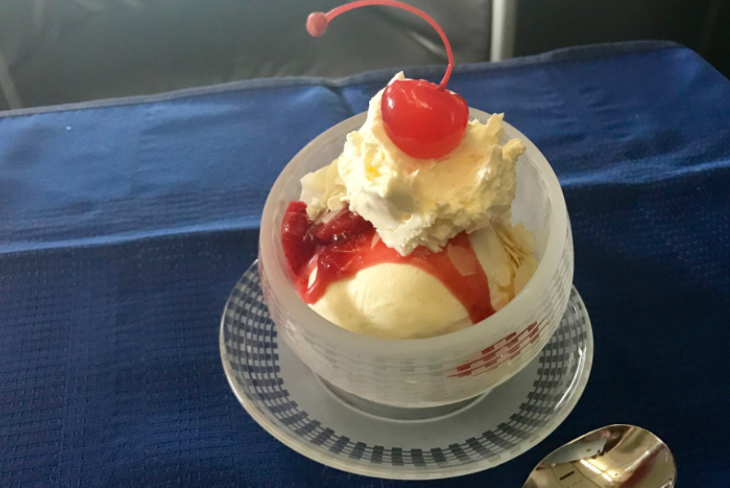 “In-flight service will also include made-to-order signature ice cream sundaes, a dessert cart with a variety of petit dessert options, chocolate truffles and wine flights. On daytime flights longer than eight hours and on all flights longer than 12 hours, hot mid-flight snacks such as lobster macaroni and cheese will be available,” United said. 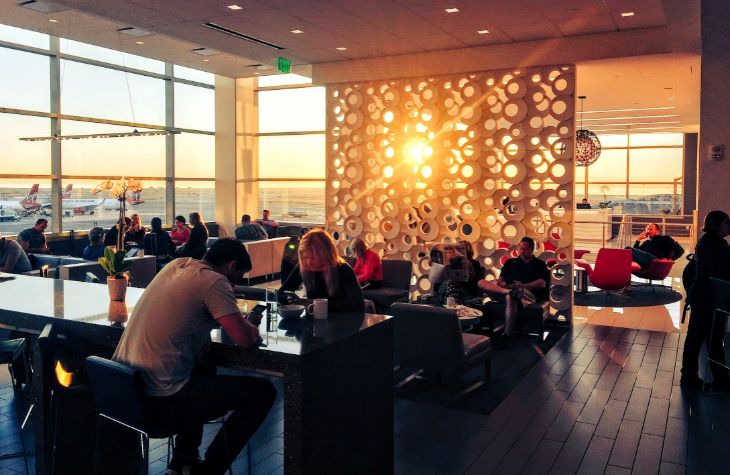 The new Polaris airport lounges will feature new custom chairs, private daybeds, spa showers, and hot meals “served in a boutique restaurant setting” so travelers can dine before boarding if they want. Private seating stations in the lounges come with pull-out desks, induction chargers, AC/USB ports and table-mounted lamps. 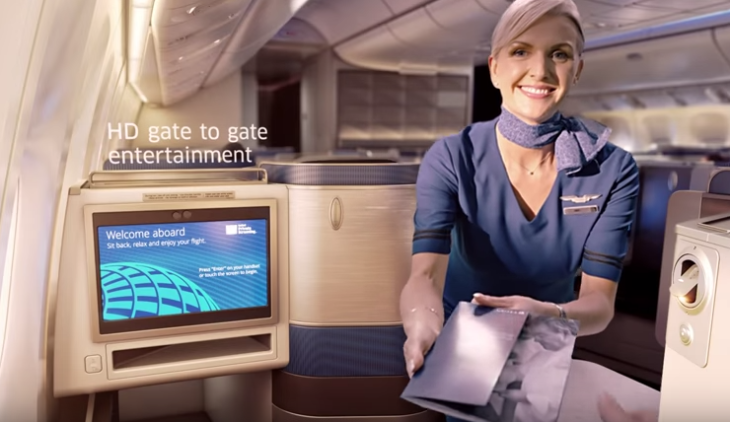 The airline has created a special website at www.United.com/Polaris to introduce all the features of the new cabins and lounges. It also offers a virtual tour of the cabin via YouTube video. 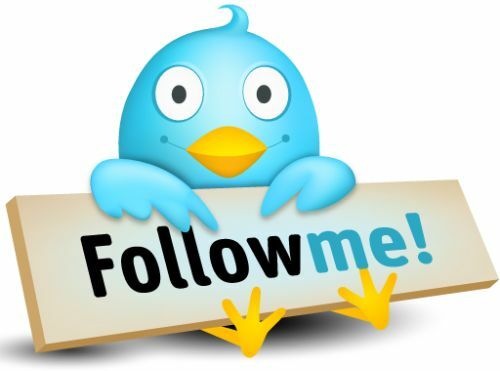 So dear readers…. what do you think? What do you like…or not like about this? Please leave your comments below.